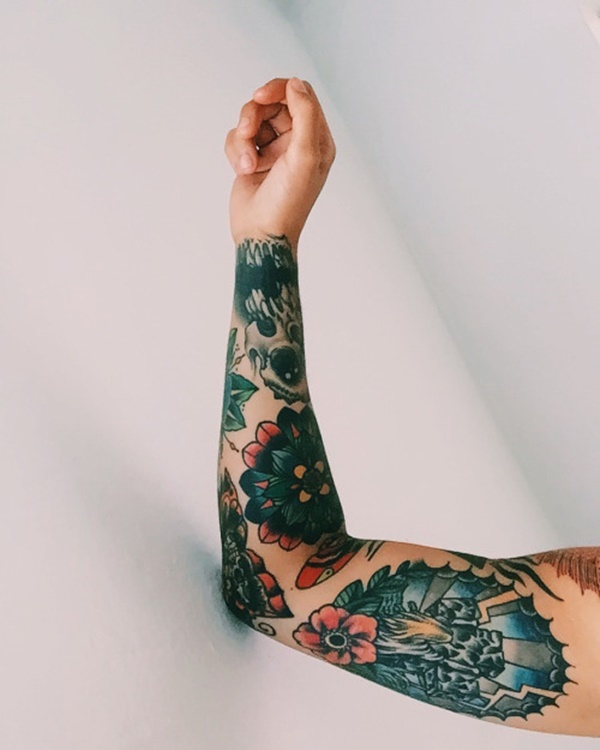 This article focuses on one hundred images depicting beautiful, colored tattoos. 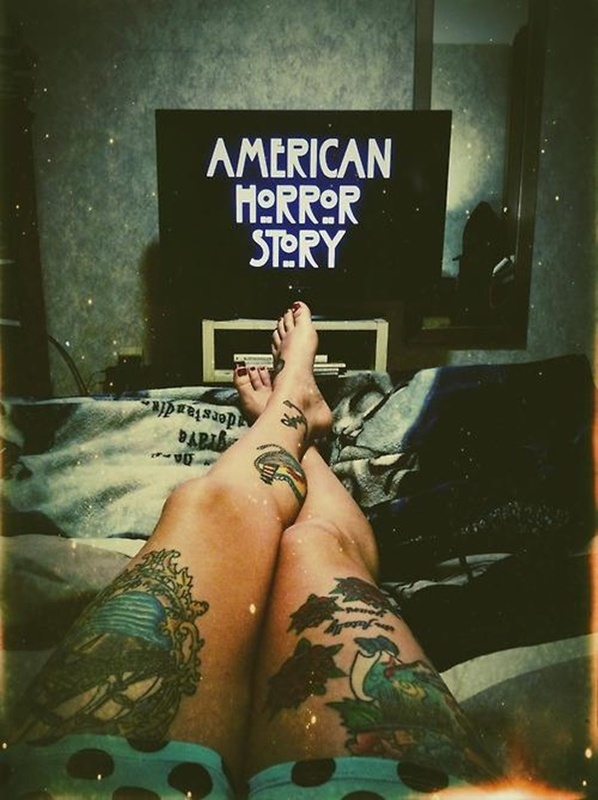 These photos will present you with the techniques, subjects, and symbolism prevalent in modern tattooing and will help you identify these features in the future. Be sure to tell us what you think in the comments section, enjoy! 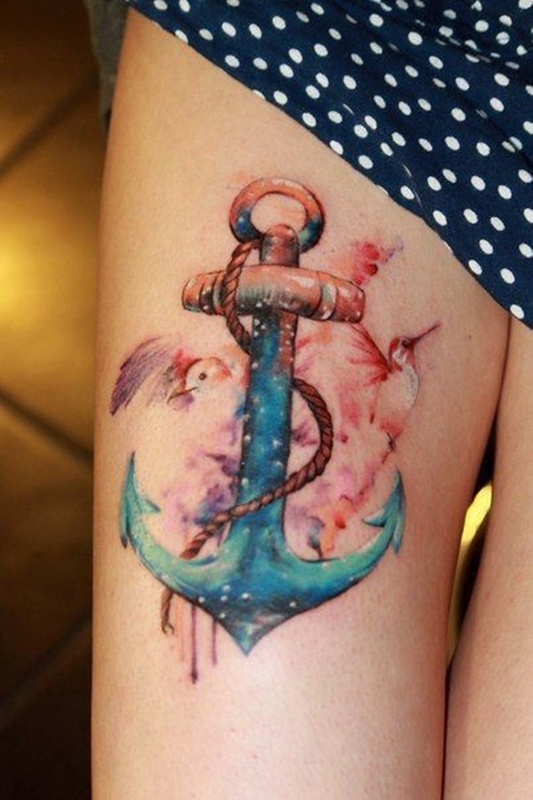 A ships steering wheel and anchor are located on the wearer’s feet. 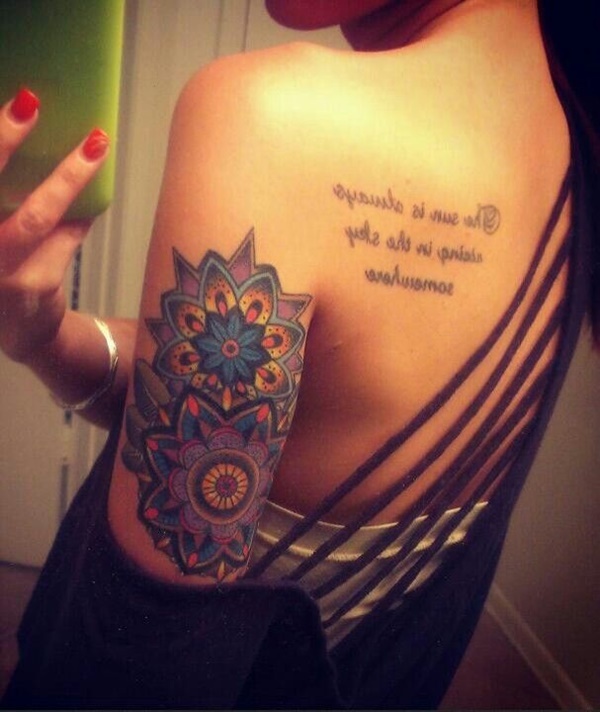 The wearer has multiple colored tattoos but the pieces don’t clash because the images have a similar color palette. 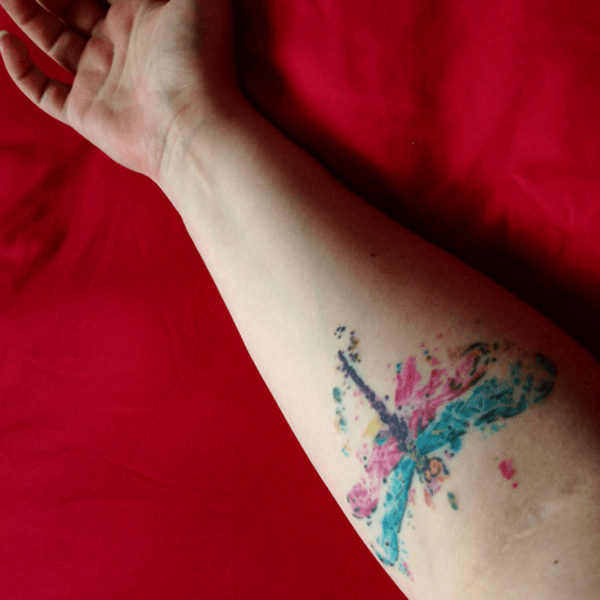 A watercolor styled depiction of a dragonfly is composed of light blue, pink, and black ink. 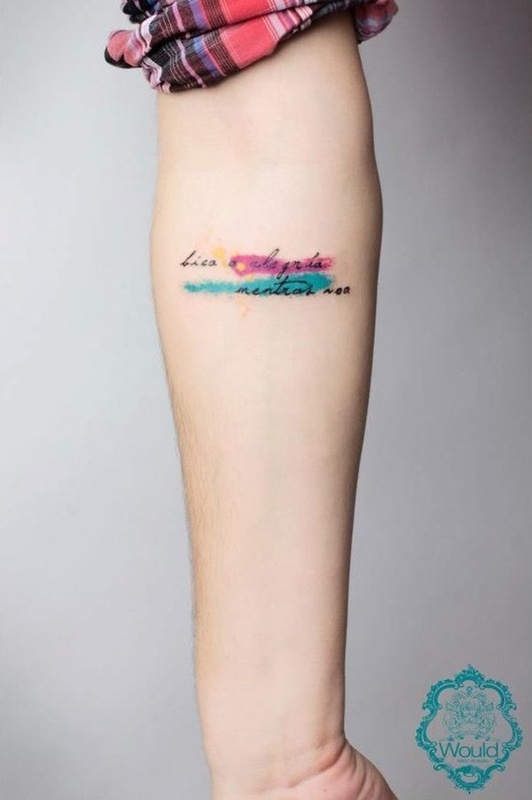 This piece, portrayed on the wearer’s forearm, is a mediocre example of the watercolor style. A vibrant blue anchor is surrounded by two watercolor depictions of birds. A dove is shown to the left of the anchor while a hummingbird is depicted to the right of the anchor. Both birds are composed using red and purple ink. A red heart with a keyhole is surrounded by purple roses and two golden keys. This piece is inspired by the “key to my heart” motif and adds the flowers for embellishment. 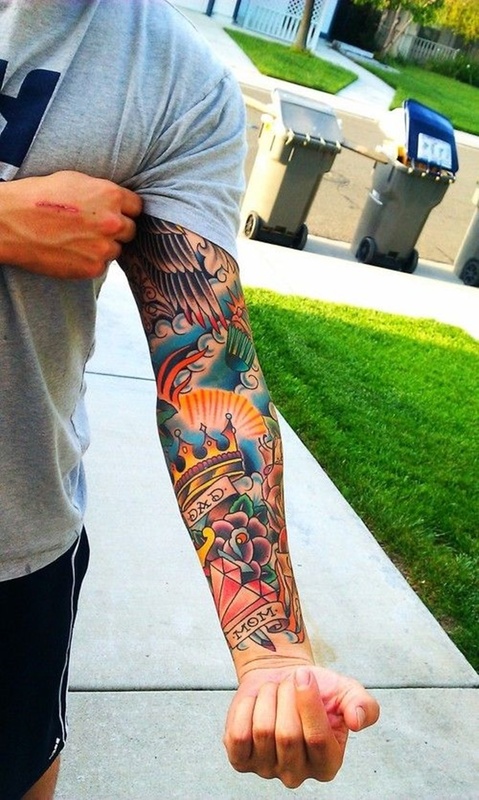 A brightly colored sleeve is rich with elements including; a crown with a banner reading “DAD”, a heart-shaped diamond with a banner reading “MOM”, flowers, wings, clouds, and sunshine. 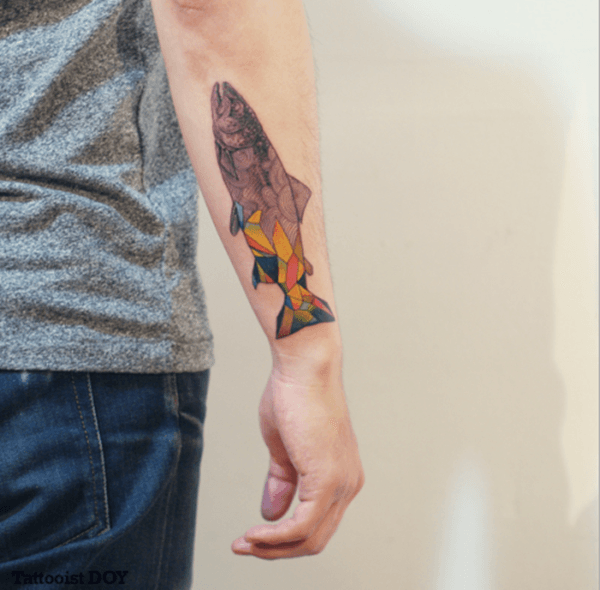 A creative concept that portrays a fish with the bottom half of the creature broken down into colorful geometric shapes. 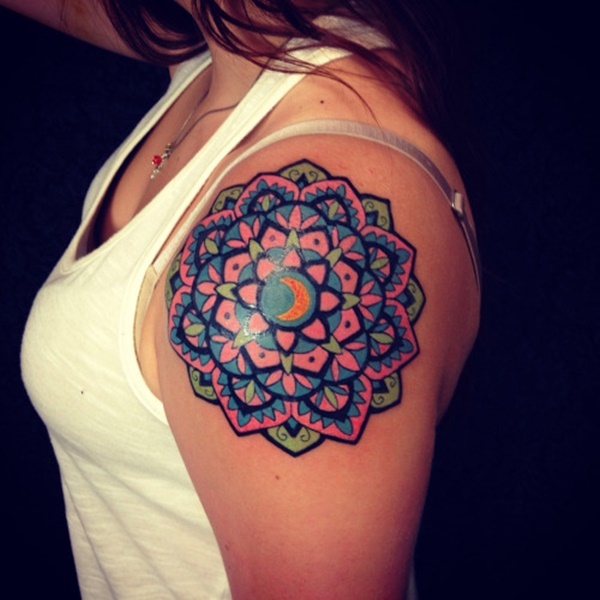 Mandalas are a beautiful image and the addition of colors makes the striking patterns pop. This random assortment of images reminds me of a flea market sales table. Seemingly unrelated items are crammed together in a single space including, animals, candles, scissors, clocks, and hearts. 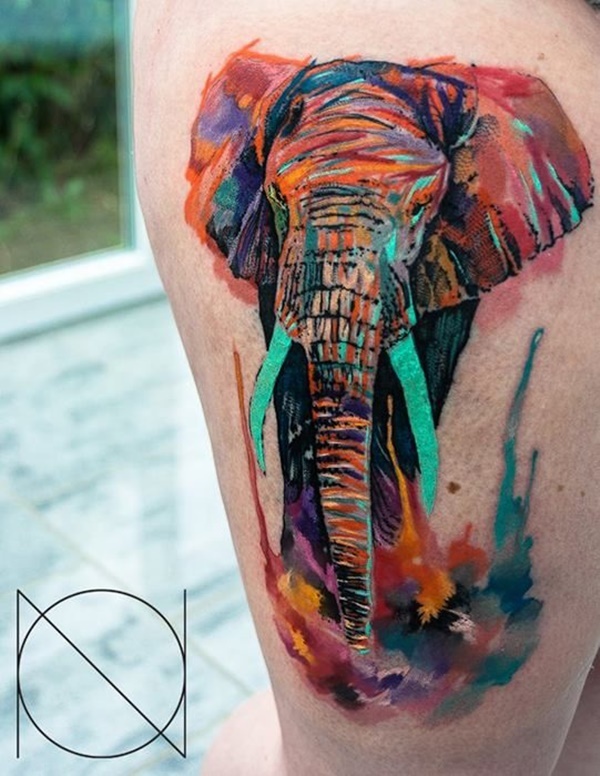 This is a beautiful tattoo depicting an elephant using only bright colors. This watercolor inspired piece uses vibrant colors and precise line work to compose this gorgeous piece. Black cursive handwriting is accented by a blue smudge and pink smudge. While this wearer has a large amount of tattoos, notice how your eyes are drawn to the bright reds in the flower on his chest and the snake on his arm. 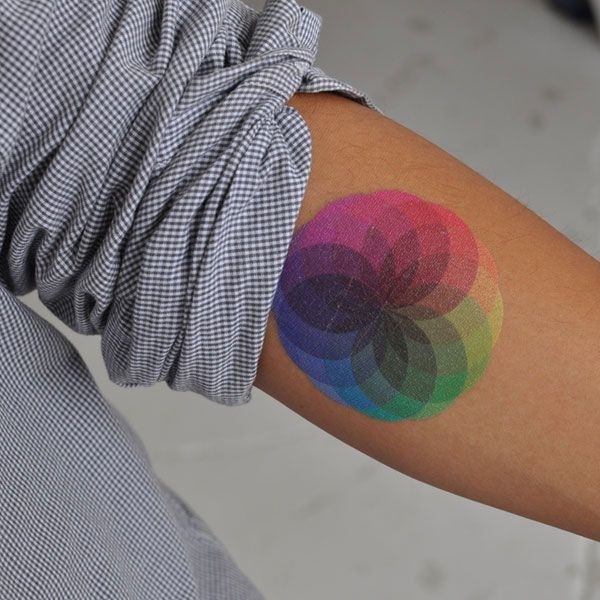 This well executed concept shows a a circle composed of multiple colors in an overlapping pattern. 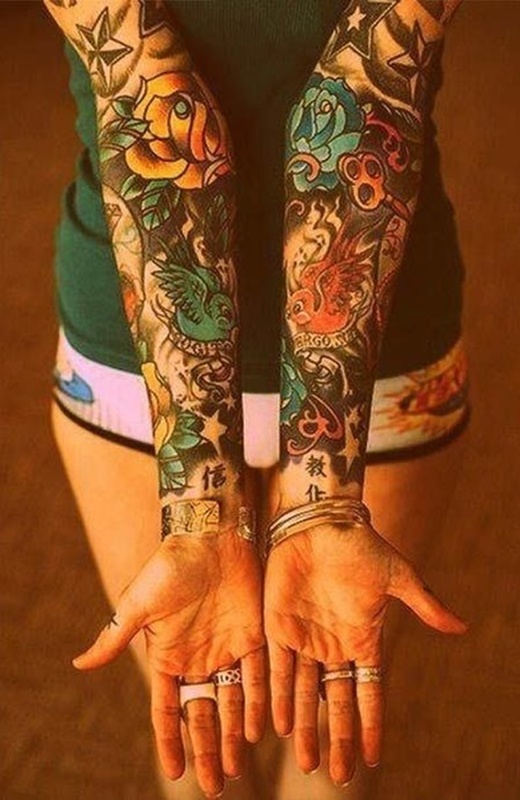 Tattoos of this nature should be done by tattoo artists that are experienced with color distribution. A cityscape shows some of New York’s most famous landmarks including; The Empire State Building and the Verrazano Bridge. The background is composed of a blue watercolor smear while the windows of the elevated train are depicted in yellow and the stop lights in red. 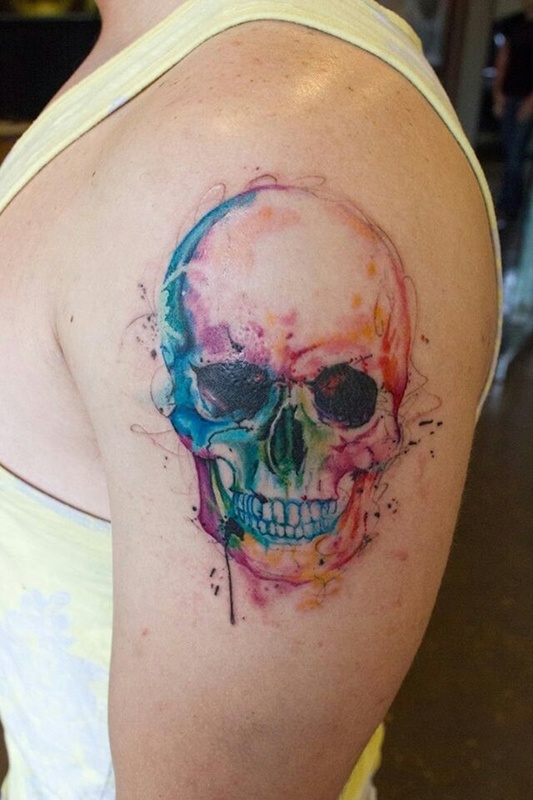 Multiple colors are used to depict a skull in this watercolor styled piece. A hummingbird is depicted in a watercolor style using a multitude of bright colors. 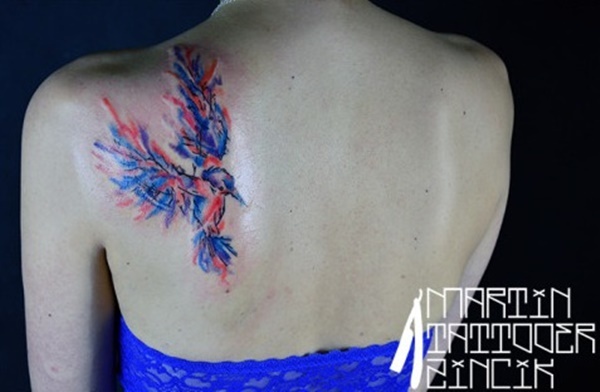 This back piece depicts a blue and red eagle composed with bold blocks of color. A crown hovers over the bird’s head and two lines cut through the piece and meet a forty five degree angle. 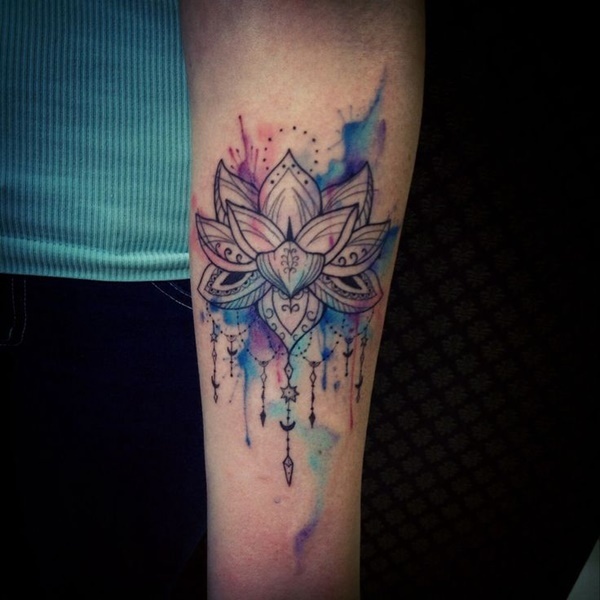 A black lotus with mandala patterns is accented by blue and purple watercolor smears. 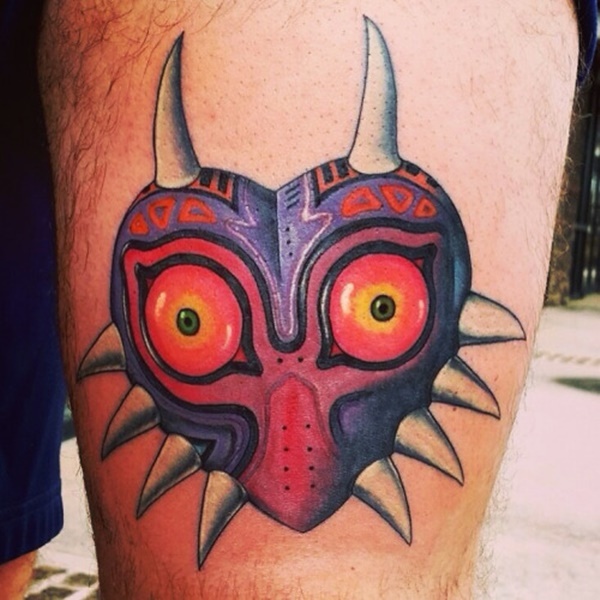 This tattoo is equal parts great concept and great execution. A woman (shown in blue) is standing beneath an umbrella as a series of watercolors cascade down upon her. This vignette shows an icy mountainside in front of a colorful background. 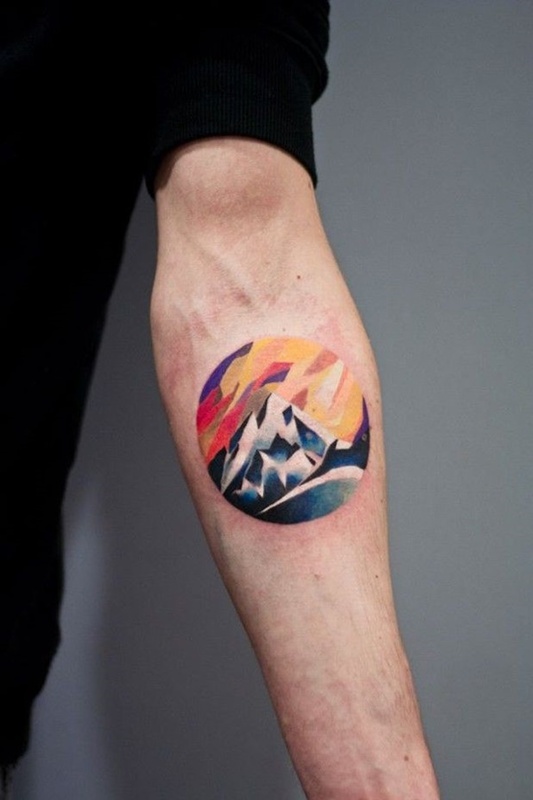 The blue and white coloration of the mountain contrasts well with the predominantly yellow background. 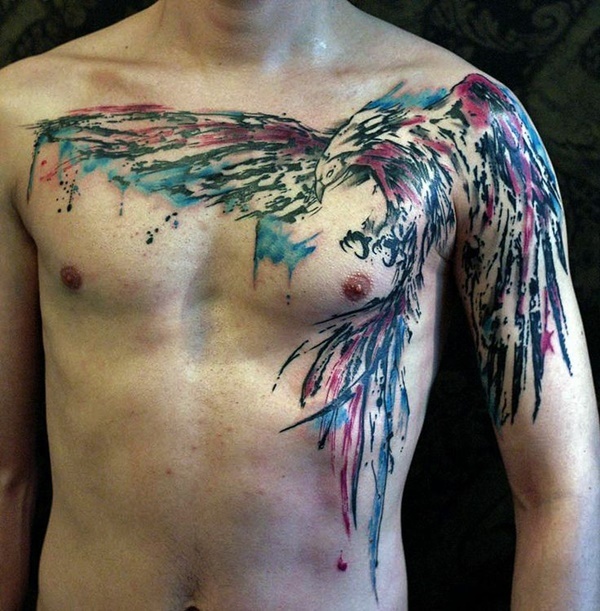 This wearer has multiple colored tattoos including the lotus surrounded by waves on his chest. The lotus is colored using a lively palette of green, orange, yellow, purple, and red. On the wearer’s left arm we see a sleeve depicting sea life including sharks and sea turtles. 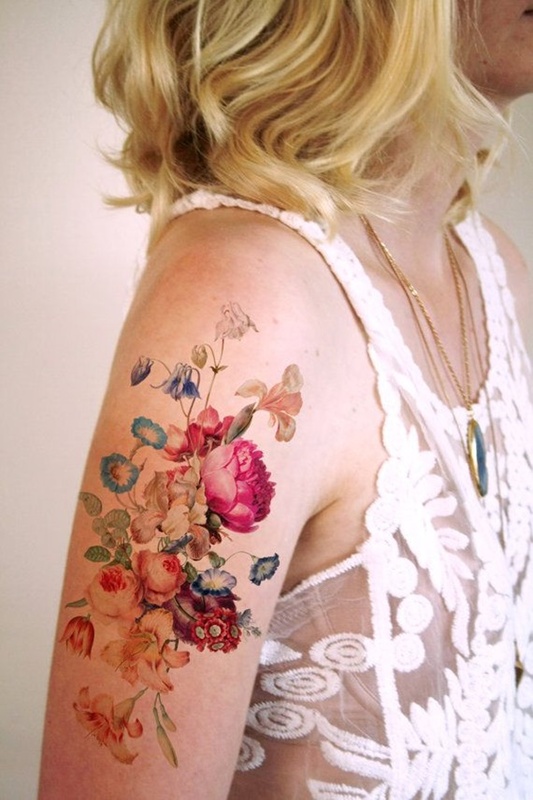 On the wearer’s right arm a flower is depicted over a blue background. The consistent use of blue in the varying pieces makes the entirety of the work cohesive. 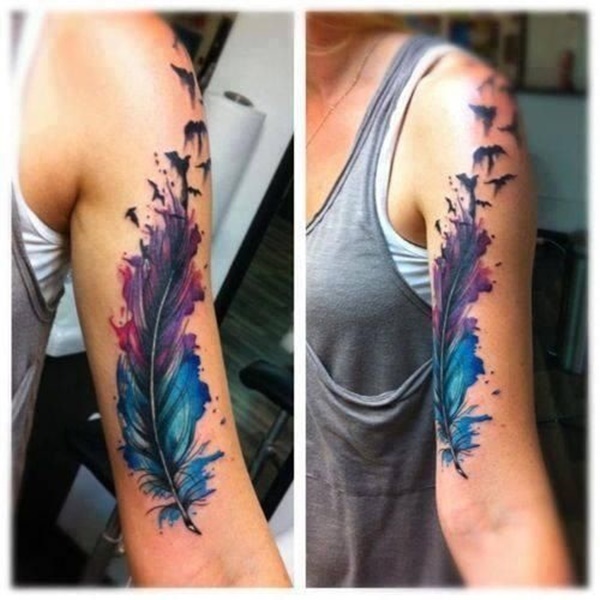 A beautifully detailed feather is depicted in blue and purple. From the top of the feather a flock of birds are portrayed in black silhouettes. A black and gray tree is depicted over a swirl of watercolors as a few leaves float in the wind. 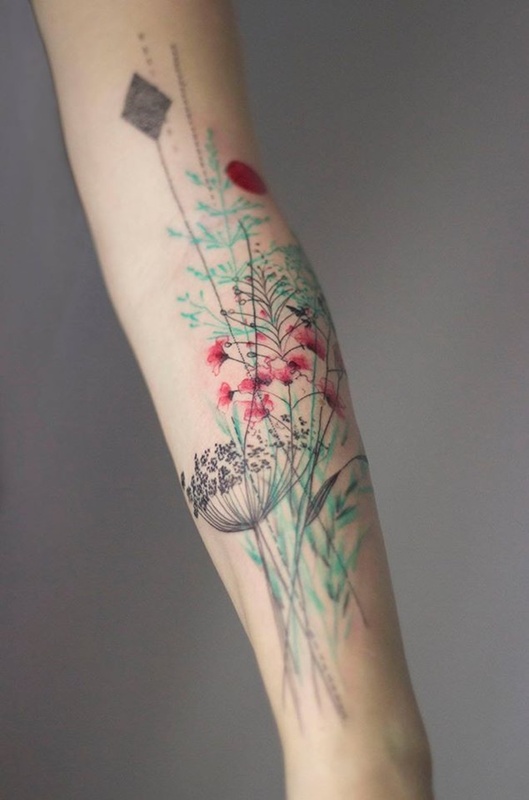 A varying assortment of flowers utilizes multiple colors in this remarkable piece depicted on the wearer’s bicep. 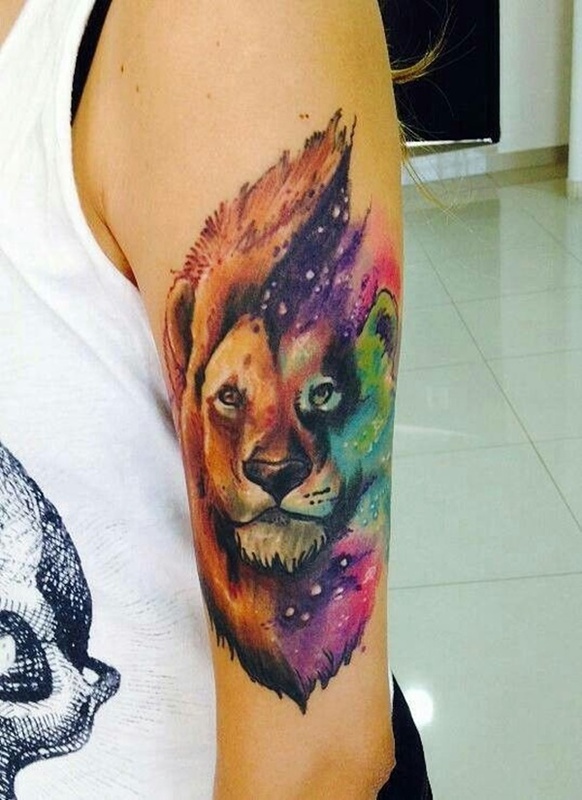 A lion portrait is divided lengthwise, depicting a realistic lion on the left side, and a purple, blue, black, and green cosmic scene on the right side. 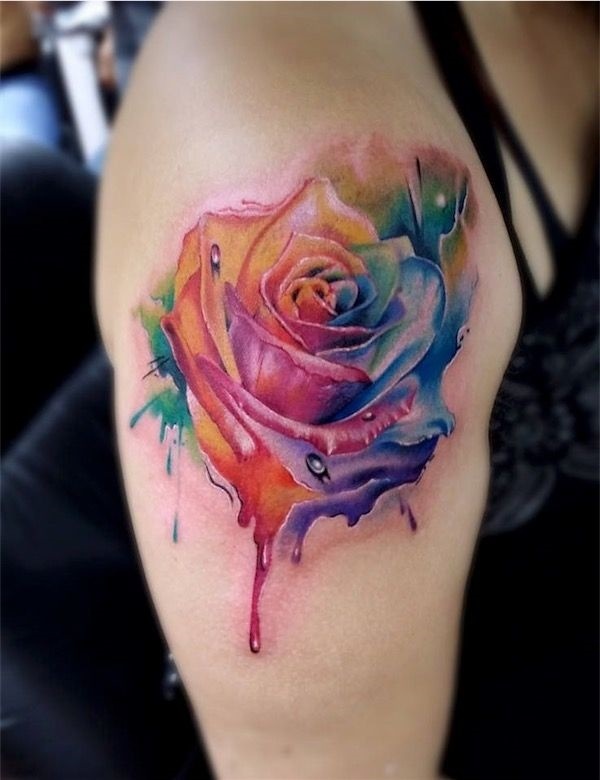 A rose is depicted in a watercolor style, using a rich palette of colors including, purple, pink, orange, yellow, green, and blue. 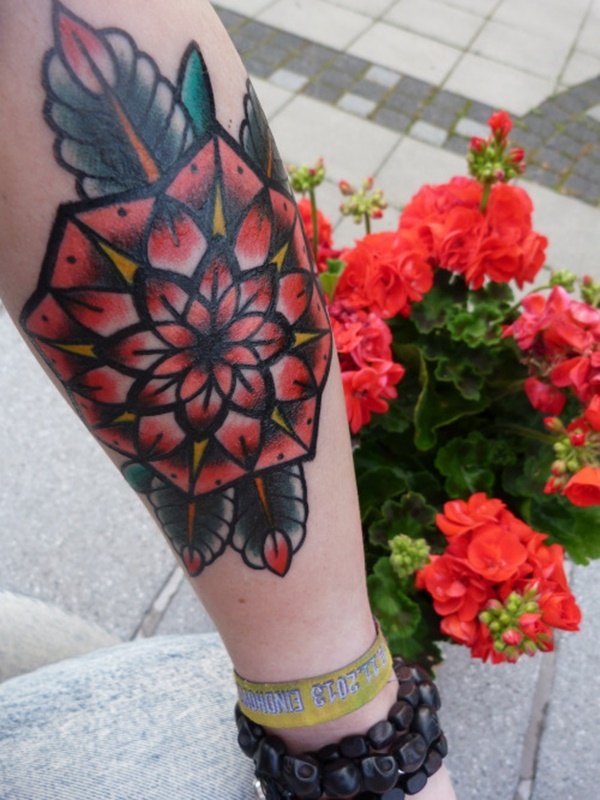 A consistent black and red motif throughout the wearer’s artwork unifies the tattoos and creates consistency. 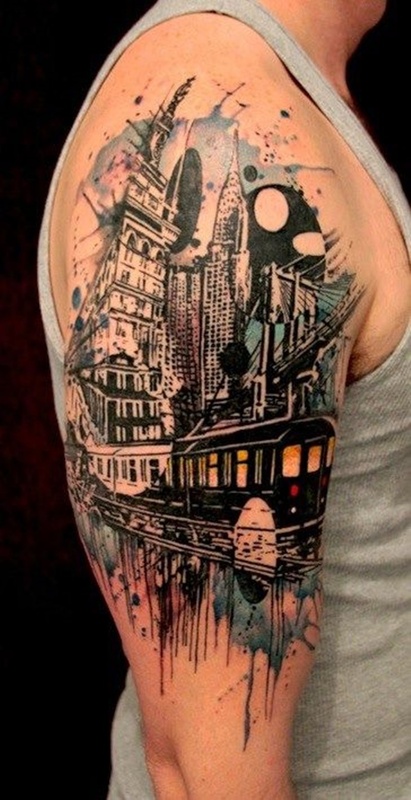 This is a truly incredible piece of work shown on the wearer’s forearm. Blue, purple, and red watercolors compose a portrait of a woman with butterflies fluttering around her face. 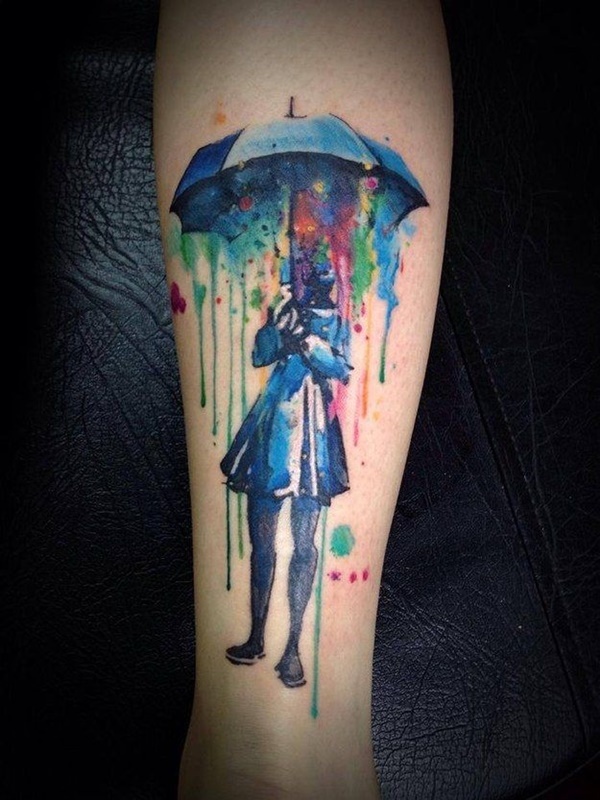 A few droplets of color run down the the wearer’s arm and create a charming detail in this outstanding piece. 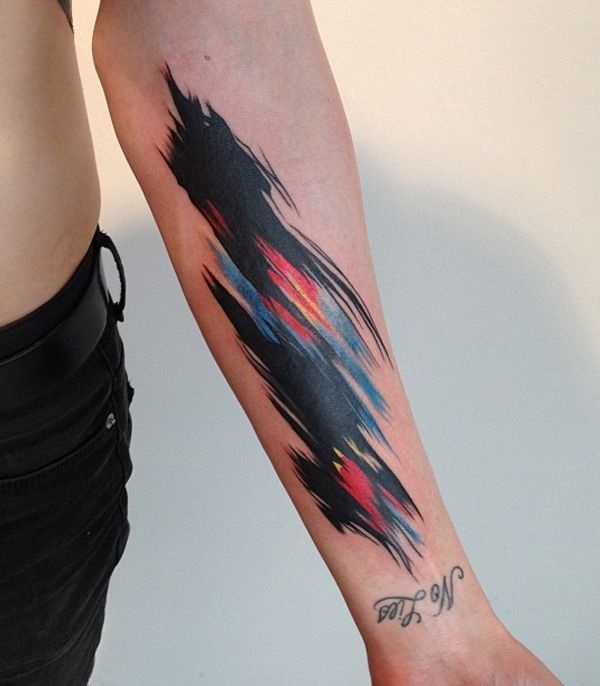 This abstract piece depicts a smear of black, red, blue, and yellow coloring on the wearer’s forearm. 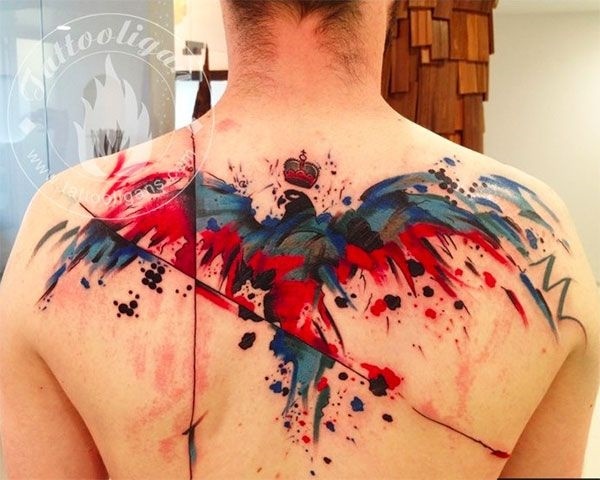 A bird is depicted using ink blot like lines and is accented with blue and red watercolor accents. 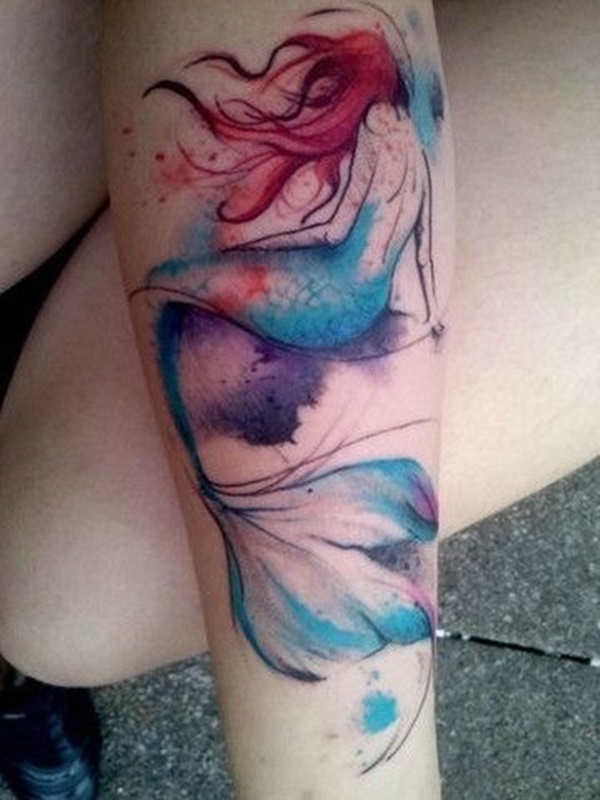 The back of a beautifully rendered mermaid is shown in this tattoo. The figures bright orange hair and blue fishtail are accented by small purple flourishes. Sideways triangles reminiscent of the PLAY symbol are accented with running black and blue watercolors. 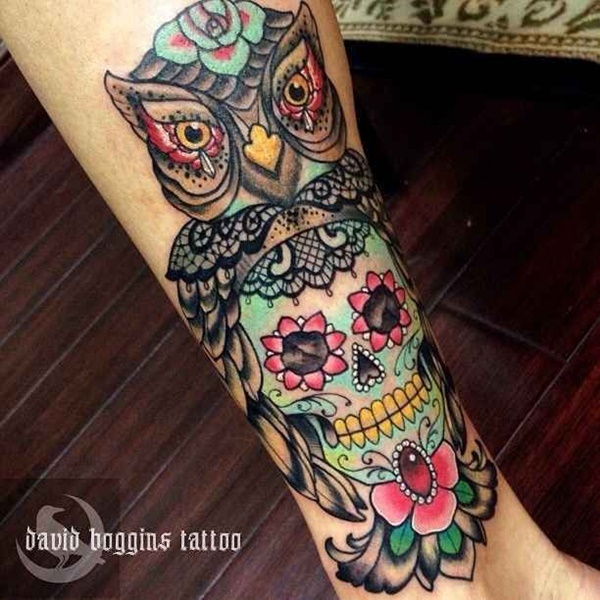 A baby blue skull is depicted on the stomach of an owl in this tattoo. The elaborate design uses traditional day of the dead designs to decorate the skull and owl while a dark red jewel sits on the skulls chin. Light green ink and red flourishes make this plant life depicting piece pop. 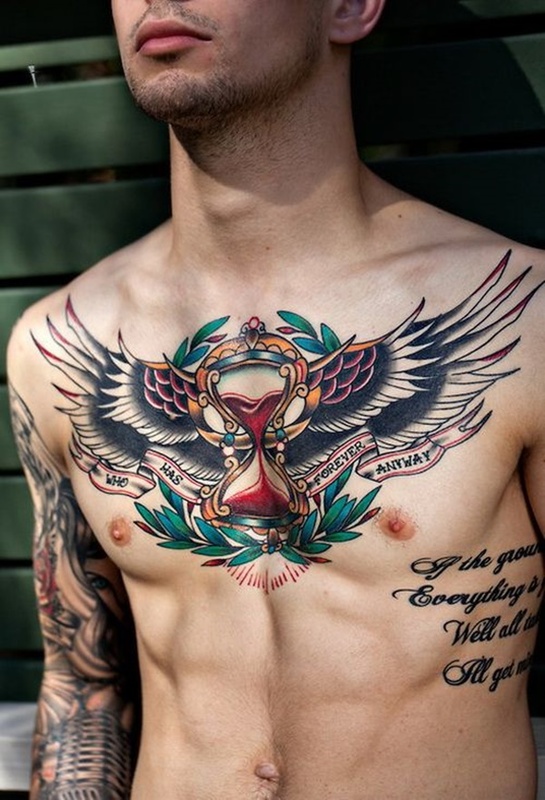 A pair of wings adorn a hourglass filled with blood and a banner reads “WHO HAS FOREVER ANYWAY.” This tattoo uses the boldly red blood and green wreath to accentuate the focal point. 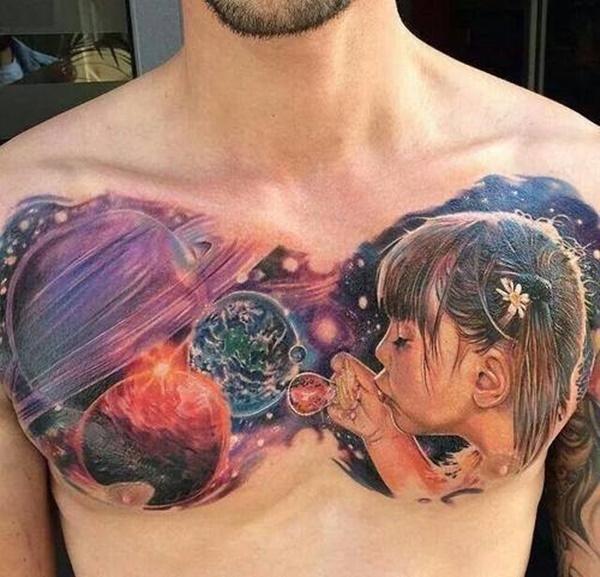 This tattoo uses images from multiple different franchises. Sonic is shown jumping toward a gold ring against a blue background. 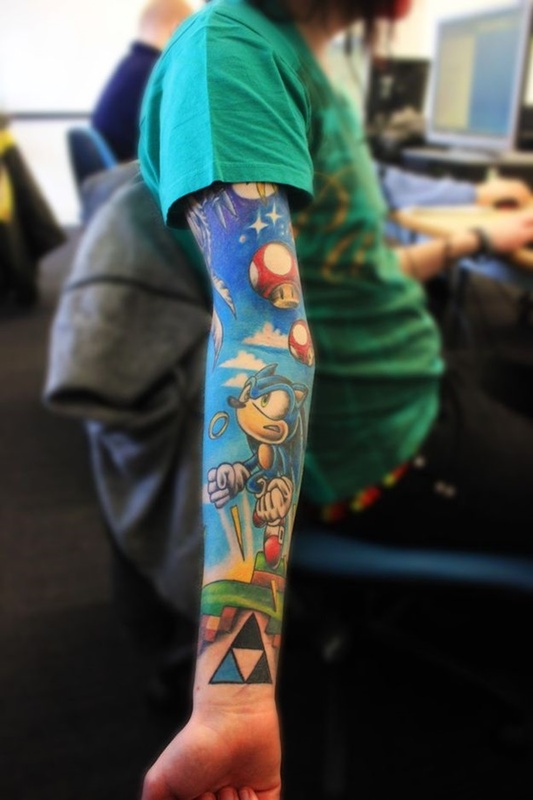 Mushrooms from the Super Mario franchise are shown to the upper right of Sonic and the symbol for the Legend of Zelda is shown on the wearer’s wrist. 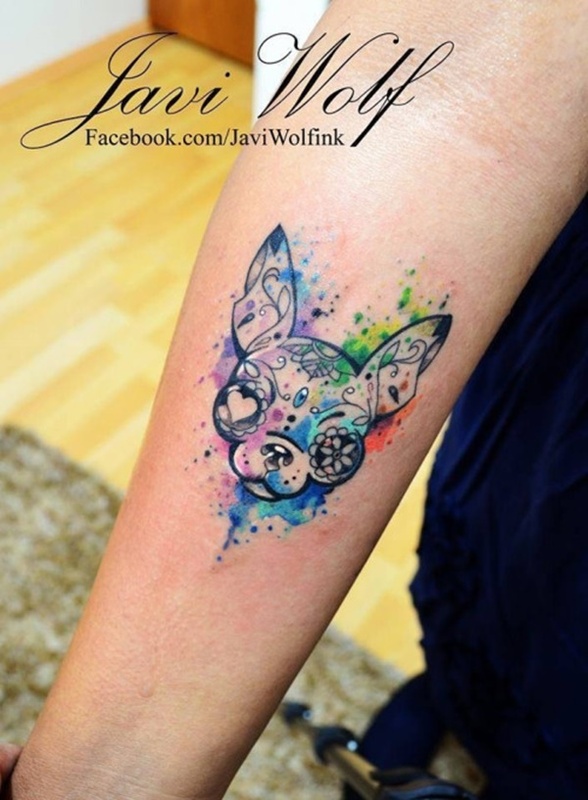 This tattoo portrays the wearer’s skin cracking and embellishes the image with watercolors. Because of their association with fire and water, red and blue are often used as opposing colors. 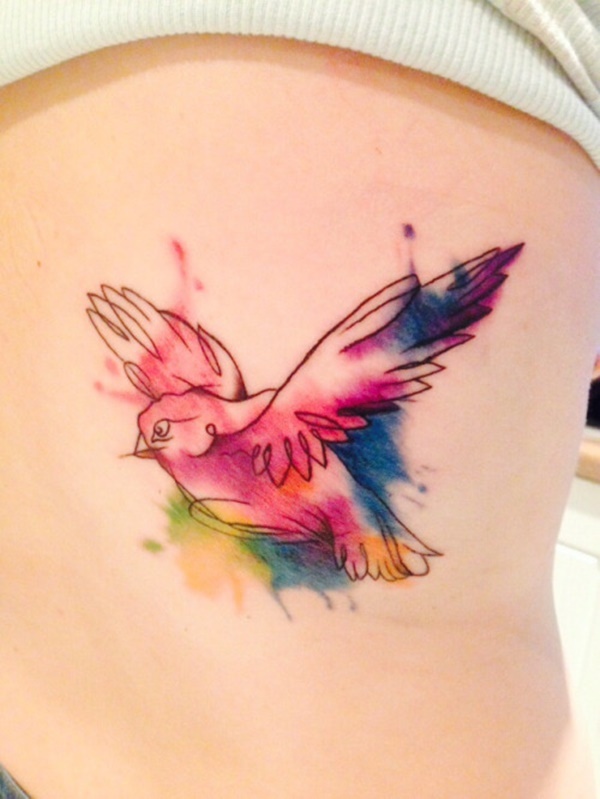 In this tattoo we see the colors used to depict the opposing sparrows on the wearer’s forearm. 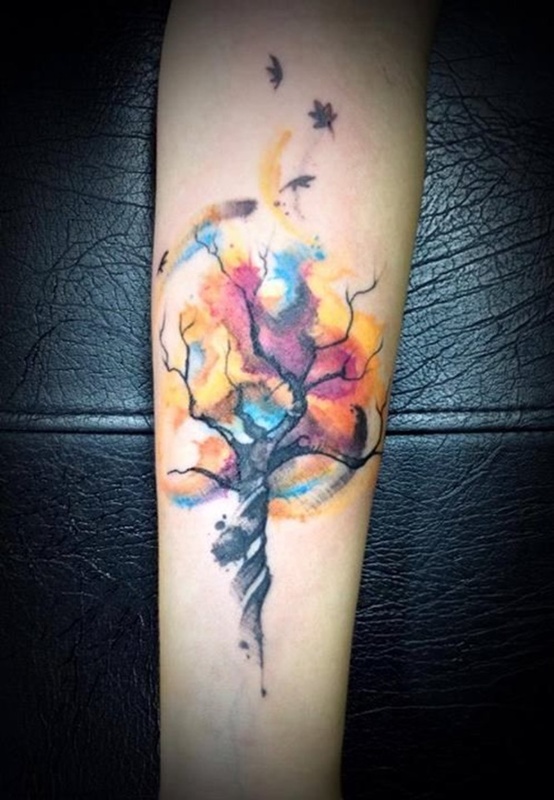 A tall, black tree is accented with ink blots and circles as blue and purple watercolors add splashes of color in this tattoo. 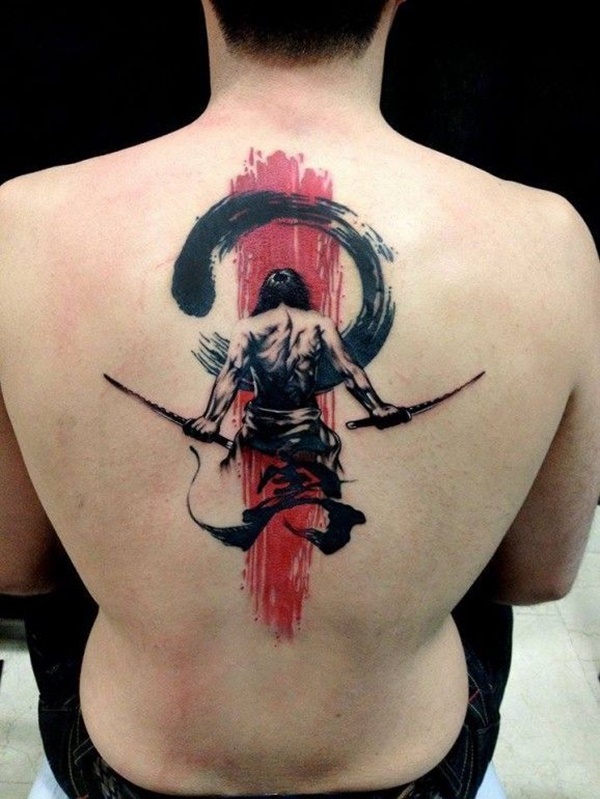 The back of a man with two drawn swords is depicted in bold blacks against a red back drop in this tattoo that runs along the wearer’s spine. Two colorful sleeves display multiple images. This tattoo shows a candy cane striped lighthouse with wings on this wearers thigh. 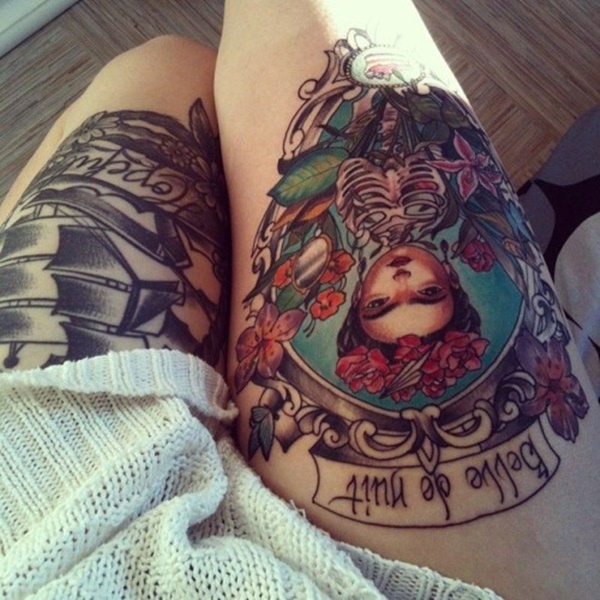 The wearer exhibits two pieces done on their thighs. 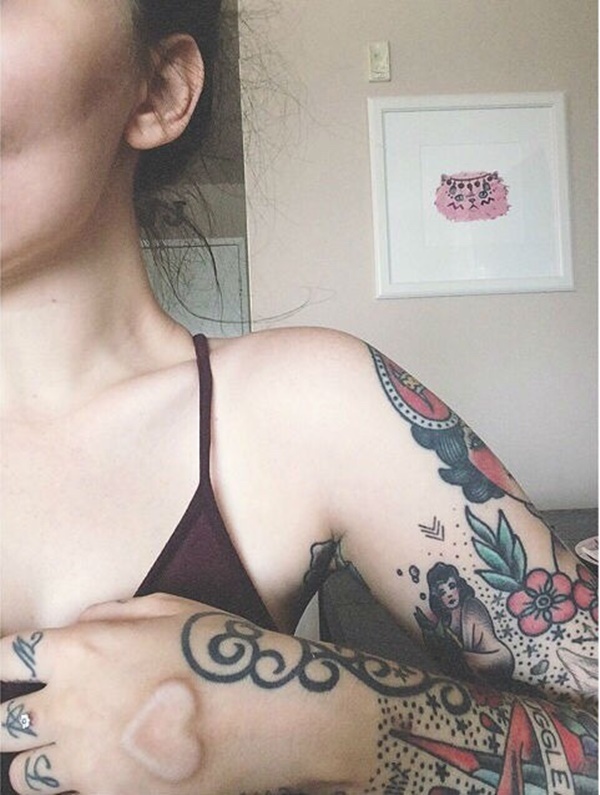 One tattoo is surrounded by roses while the other is surrounded by an ornate gold framing. 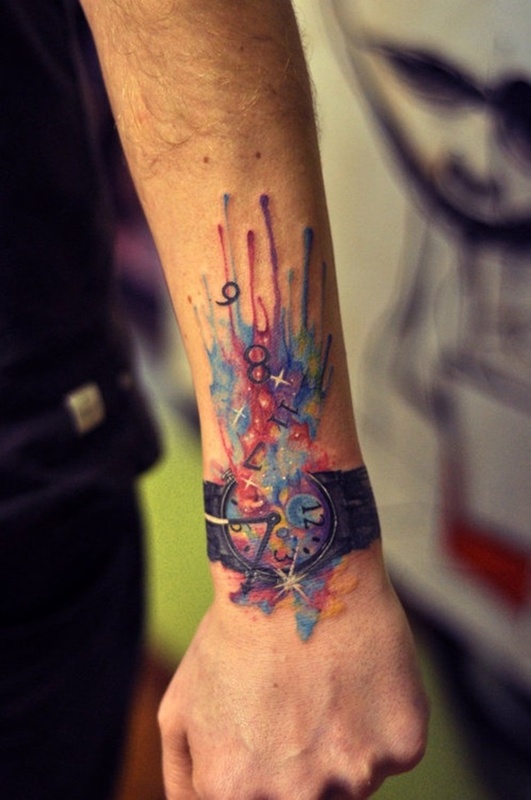 A wrist watch explodes with color in this innovative piece. 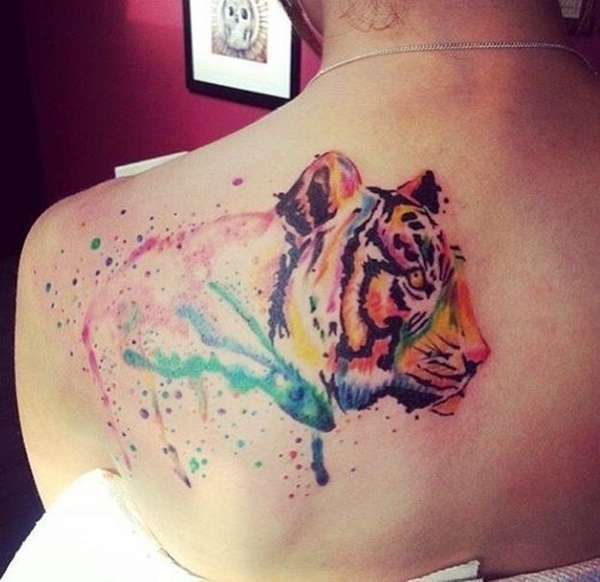 The side profile of a tigers head is done in bright watercolors in this back piece. 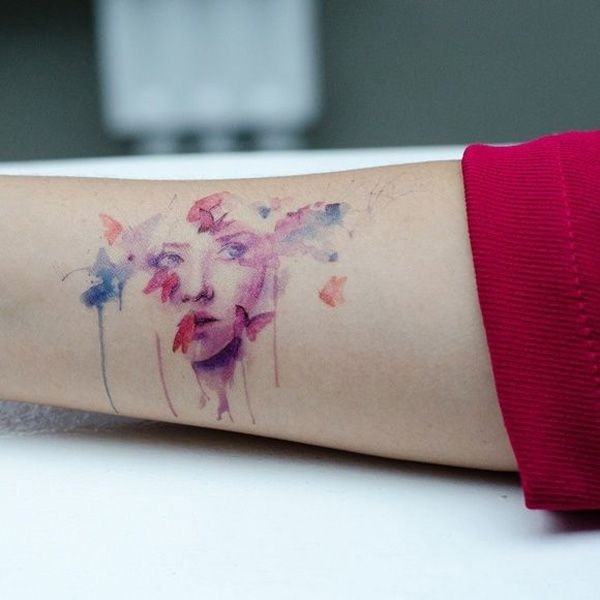 The wearer’s sleeve depicts multiple flowers and uses bold colors to draw the eye. 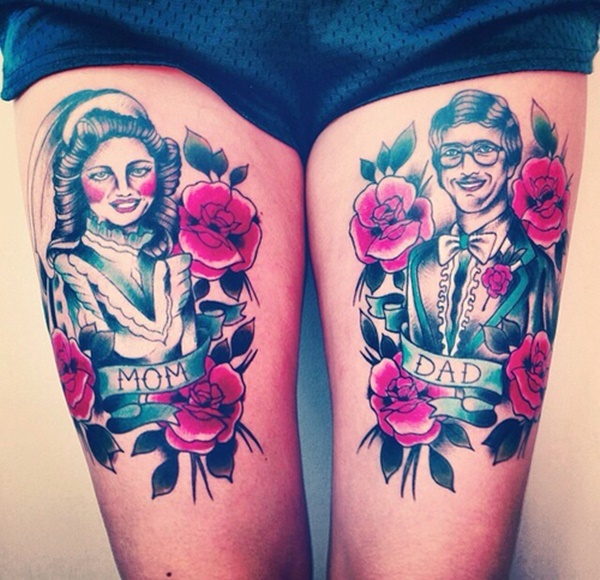 Stylized portraits honoring the wearer’s mom and dad are shown on the back of the wearer’s thighs. 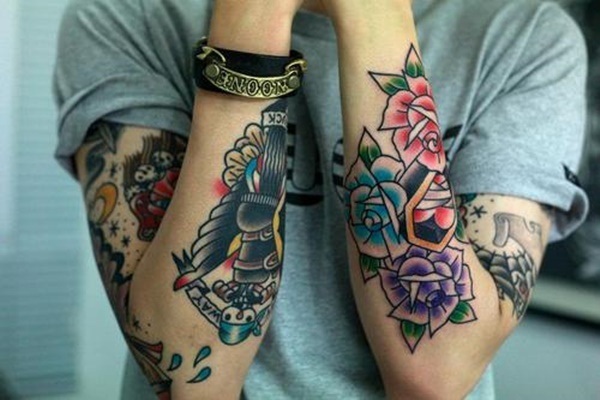 The portraits are surrounded by red roses and the tattoos are accented with touches of blue. A red mandala is accented with a pair of feathers. The mandala is a soft shade of red while the feathers show touches of orange and red. A bird composed of black outlines is found in the middle of three roses in this bicep piece. 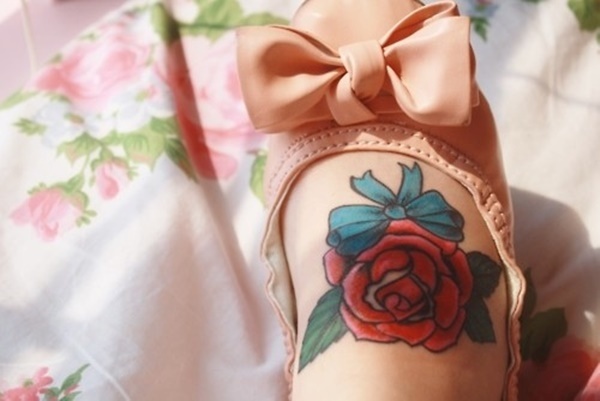 A rosebud with a blue bow is tattooed on the wearer’s foot. 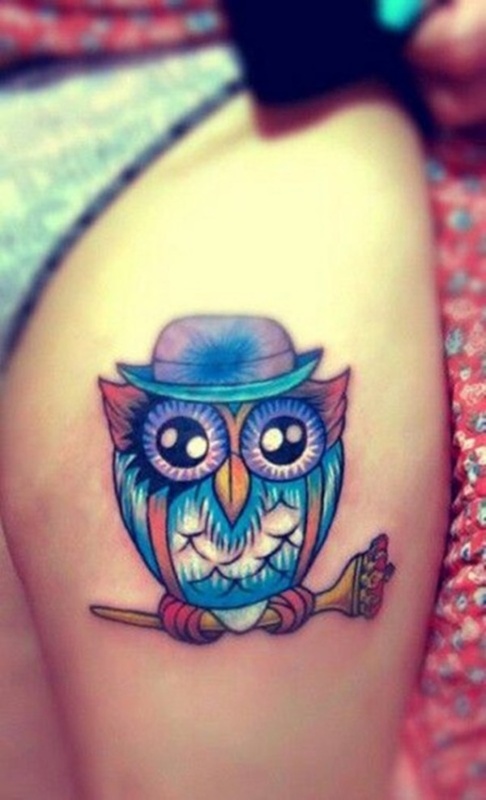 A dapper owl perches upon a staff while wearing suspenders and a bowler in this tattoo. The bird is comprised of mostly blue and purple ink while the scepter is gold with a red top. A lotus flower and water is shown on the wearer’s right arm while small flowers and a blue jay are found on her left arm. A chihuahas head is accented with watercolors and elaborate patterns in this unique piece. A lotus is drawn in the dogs left eye while a heart is shown in the dogs right eye. 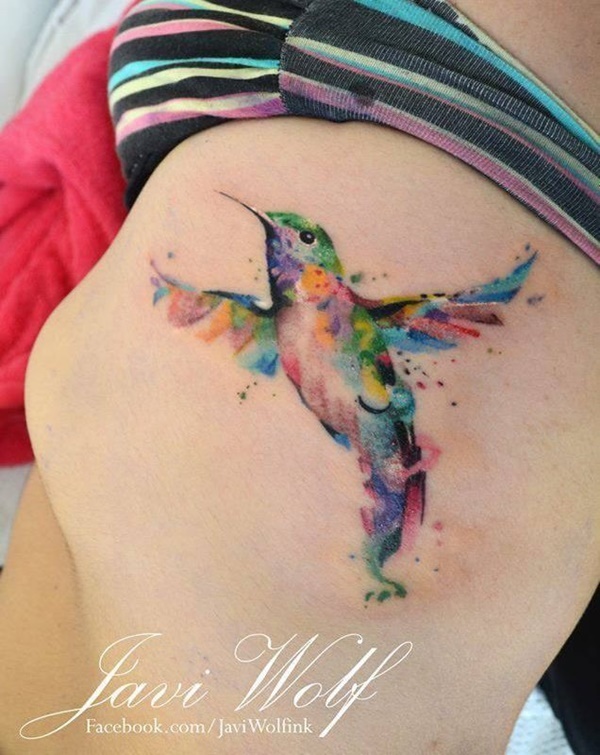 A yellow skull over a swirled red background is shown on the wearer’s back while a colorful hummingbird is depicted on her bicep. 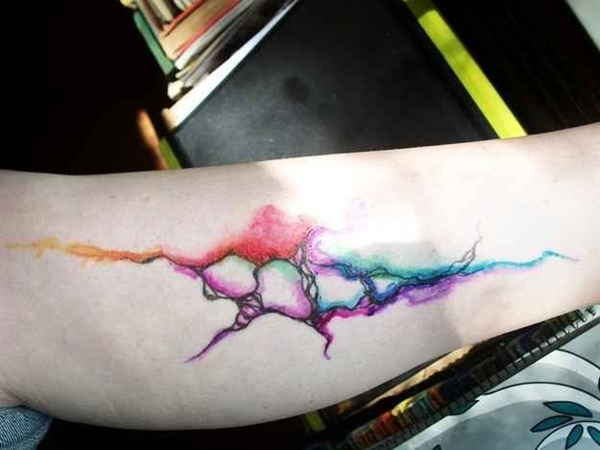 The dense collection of colorful tattoos creates the effect of graffiti on the wearer’s right bicep. 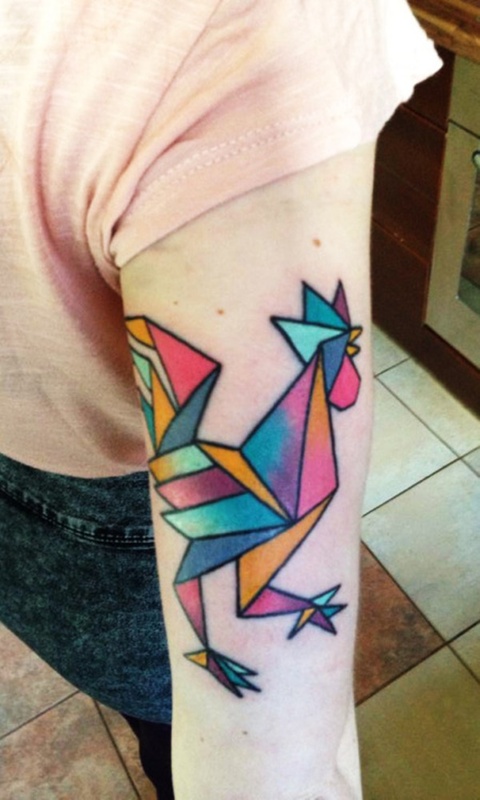 A rooster is broken down into geometric shapes and colored using pinks, purples, blues, and oranges in this tattoo. 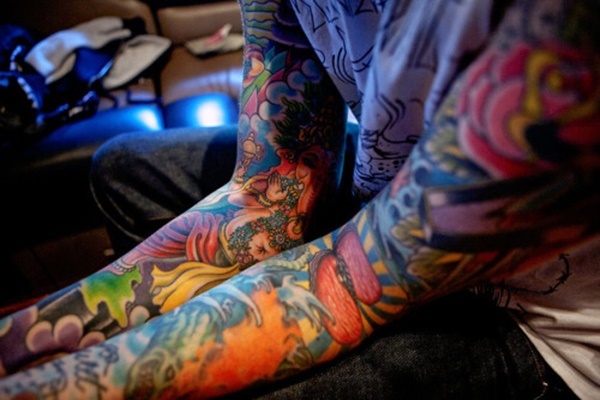 Multiple colorful tattoos compliment one another in this elaborate sleeve. A bird is shown preparing for landing in an astounding color palette using blue and red. The eye is drawn to the brightly colored roses on the wearer’s chest in this photo. 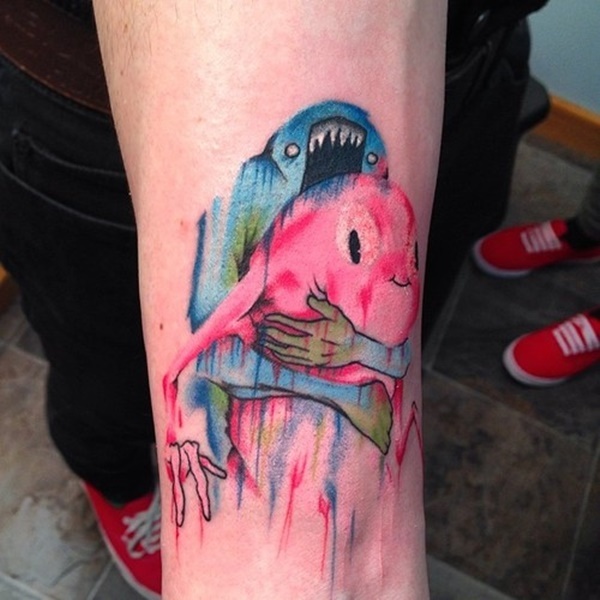 A blue creature with sharp teeth cradles a smiling, pink, circular creature in this obscure tattoo. This fascinating concept portrays a small girl blowing bubbles that create cosmic bodies and planets. 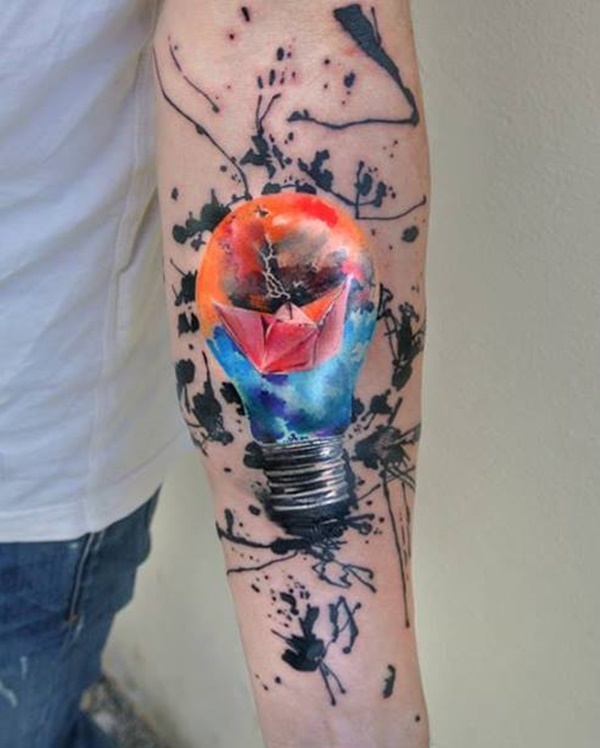 A colorful light bulb holds a piece of origami and is surrounded by ink blots in this surreal tattoo. The consistent use of blue throughout the wearer’s work draws the eye to the various pieces along her body. 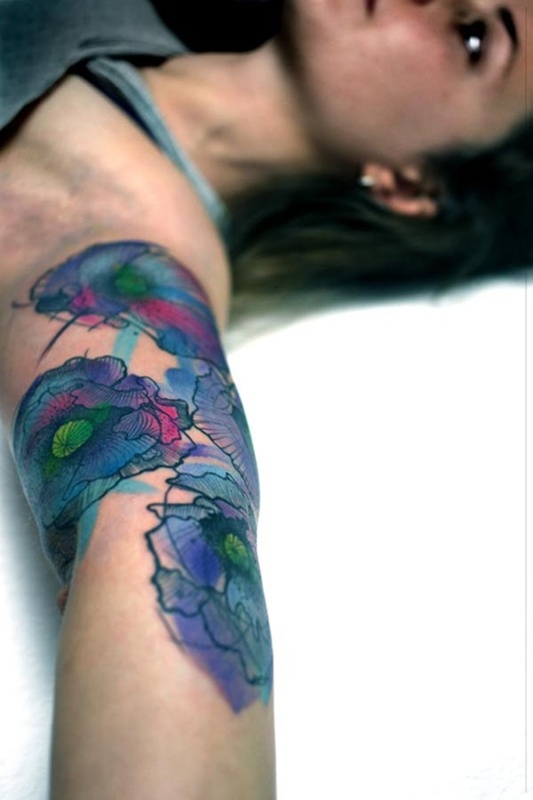 Deep blues, purples, and greens are used to breathe new life into the popular image of flowers in this tattoo. A yellow and red crescent moon sits in the middle of an elaborate mandala pattern colored with pinks, blues, and greens. 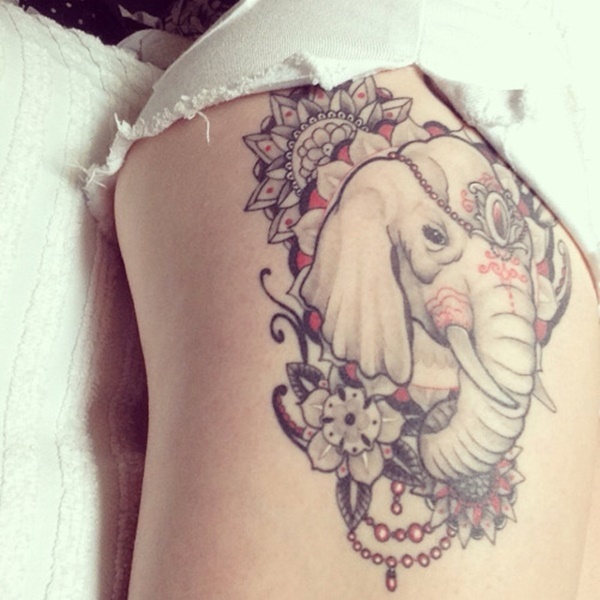 A heart shaped creature displays amazing detail in this tattoo. Horns poke out from many animals of the beast while the expert color distribution gives life to the eyes. Blue, purple, and red roses are depicted on the wearer’s left arm while a small bird wearing a bandana perches atop a motorcycle on the wearer’s right arm. 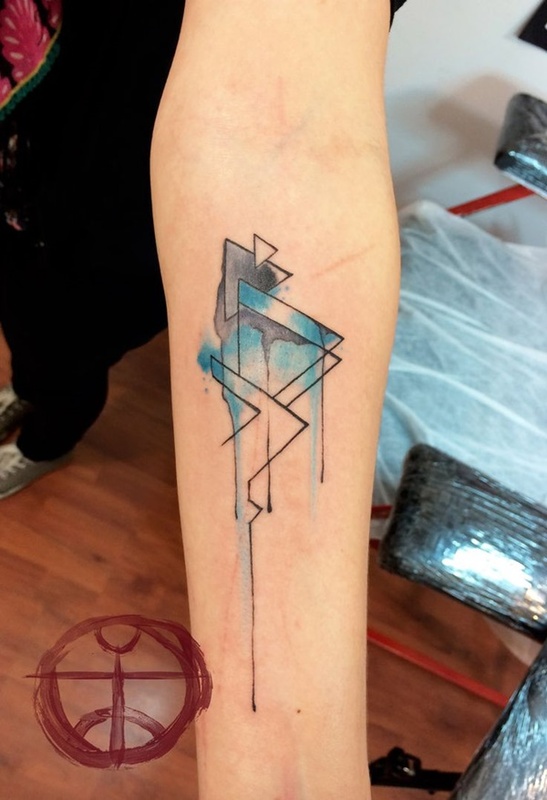 This wearer creates continuity by using reds throughout their tattoos. The wearer is also displaying a heart shaped microdermal piercing on their hand. 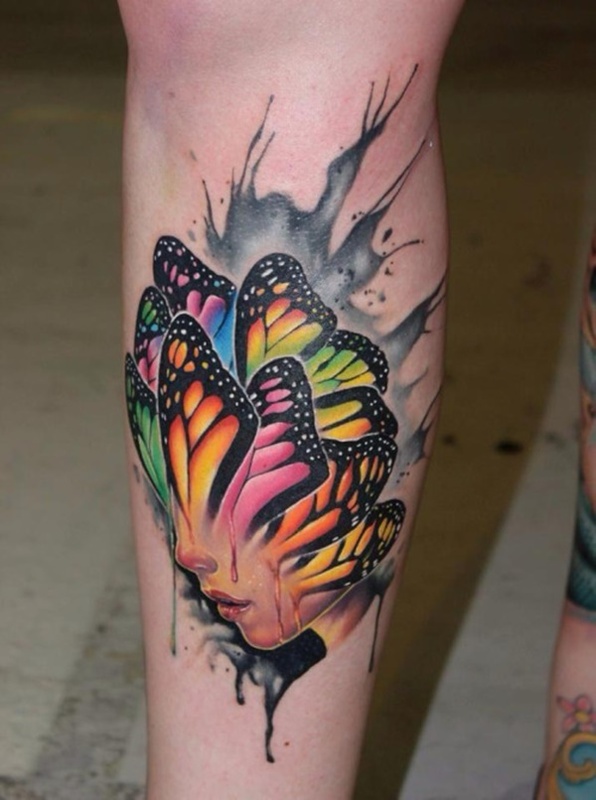 A series of brightly colored butterfly wings overlap and cover a woman’s face in this abstract portrait. 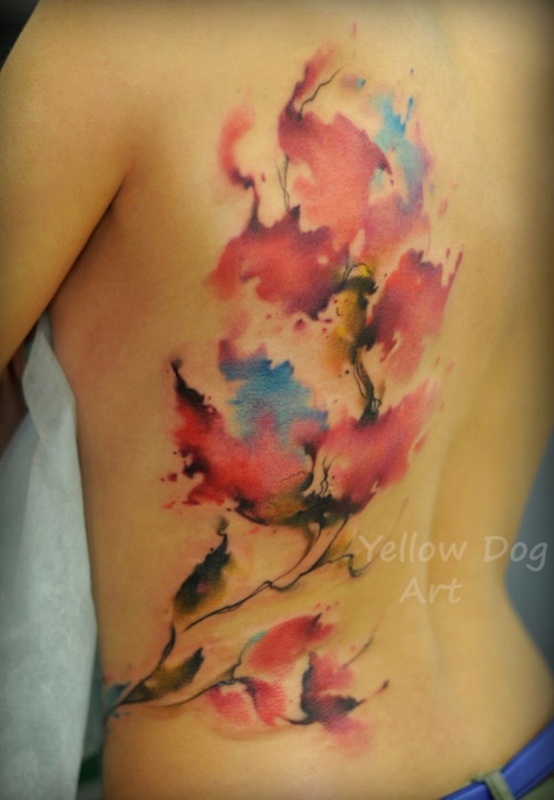 Soft watercolors climb the length of the wearer’s back in this abstract tattoo. The consistent use of color in this wearer’s work brings the pieces together and creates a sense of continuity. 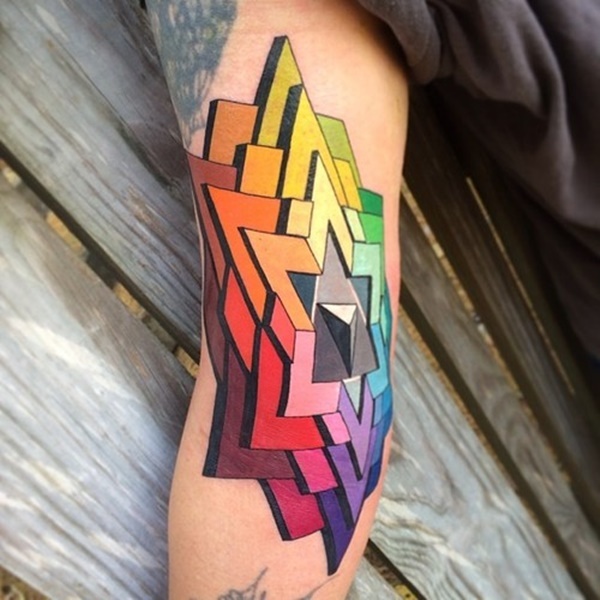 A colorful depiction of an overlapping Star of David comprises this tattoo. 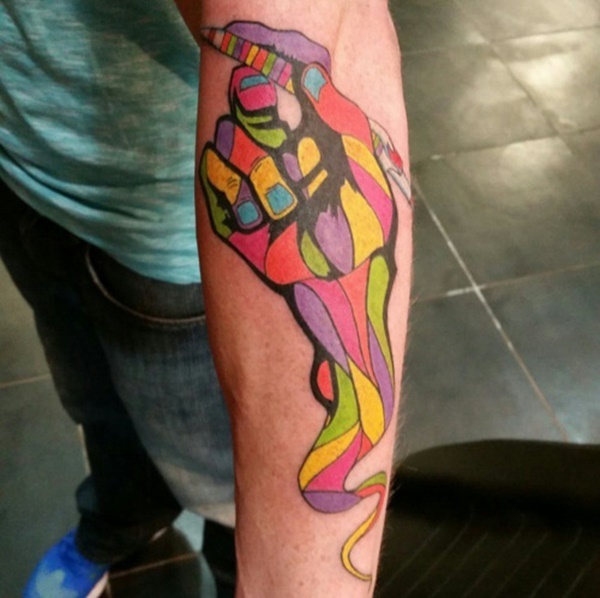 A multi-colored hand is shown holding a multi-colored pencil in this off the wall tattoo. A lotus bud sprouts an origami design while the roots of the lotus are represented by a black line. The line descends past a crescent moon and into the soil where it sprouts roots. 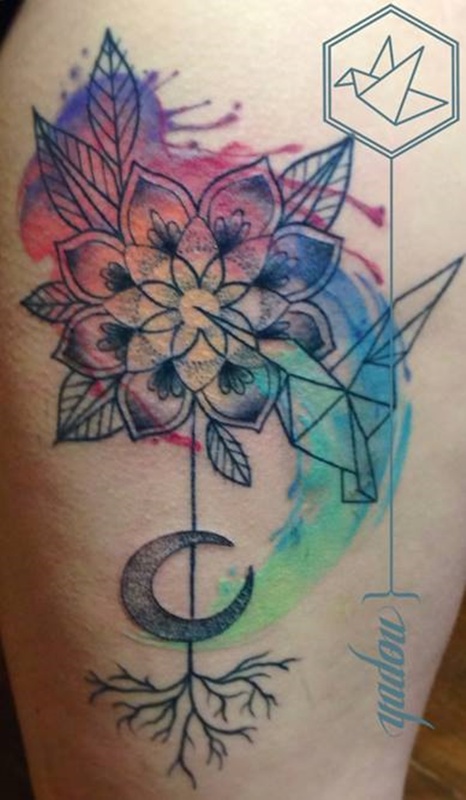 The whole tattoo is embellished with a swirl of watercolors that are darkest near the center of the lotus and lightest around the crescent moon. 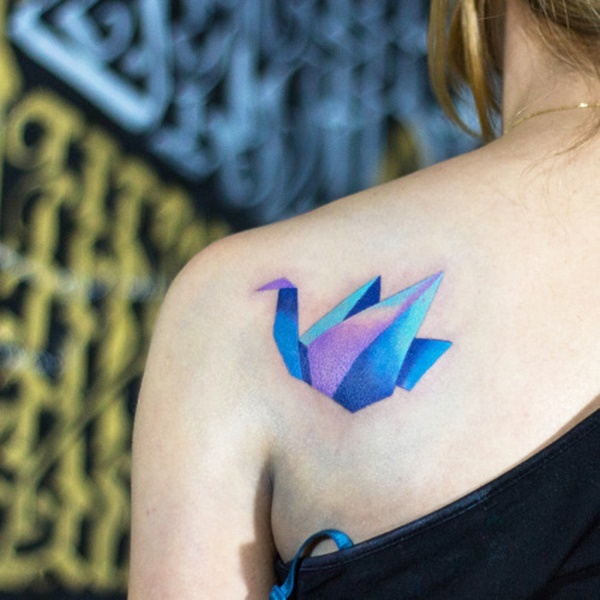 An origami swan is depicted in bright blue and purple ink. 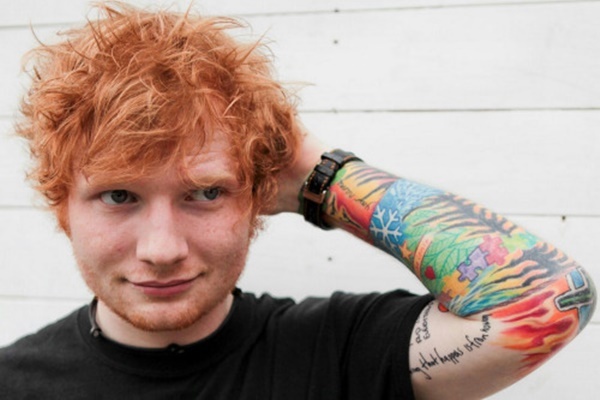 Ed Sheeran’s tattoos are densely packed and depict colorful patterns including snowflakes and puzzle pieces. 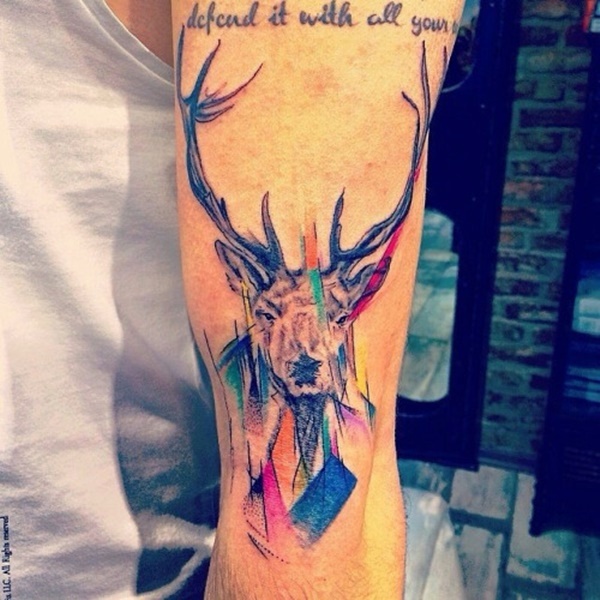 A black and gray portrait of a buck is livened up by touches of bright colors. 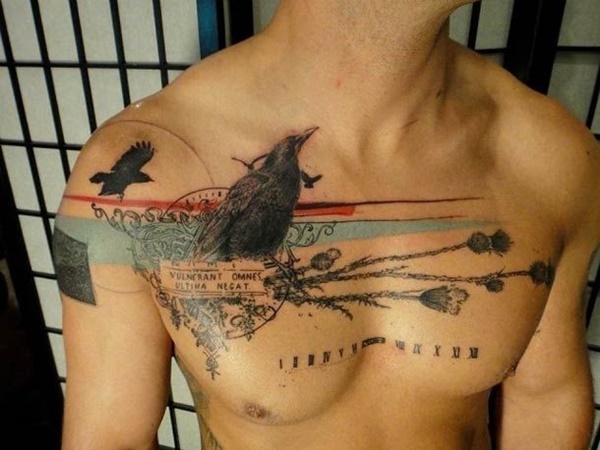 An elaborate chest piece has a blue centerpiece and is embellished with red roses. 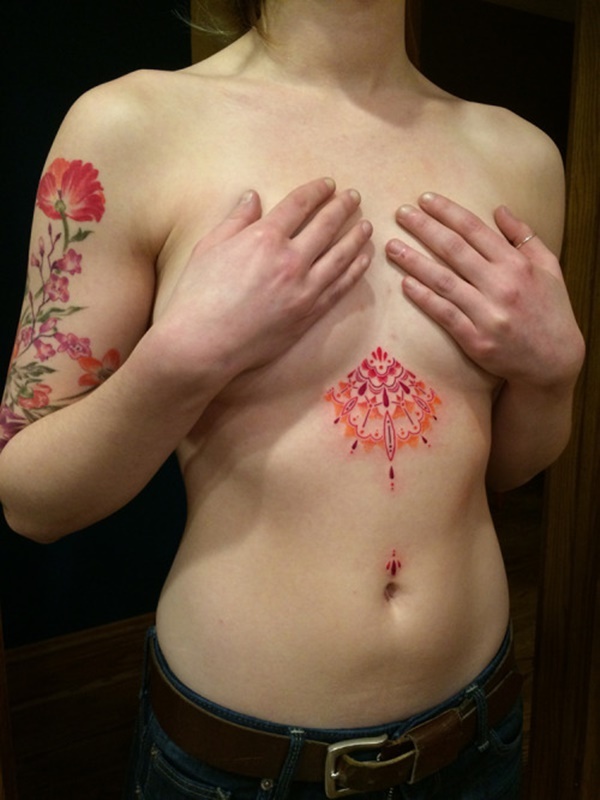 A piece of a mandala pattern is depicted in red, orange, and purple between the wearer’s breasts in this tattoo. The pattern continues with a small embellishment above the wearer’s belly button and draws the eye along the lines of her body. 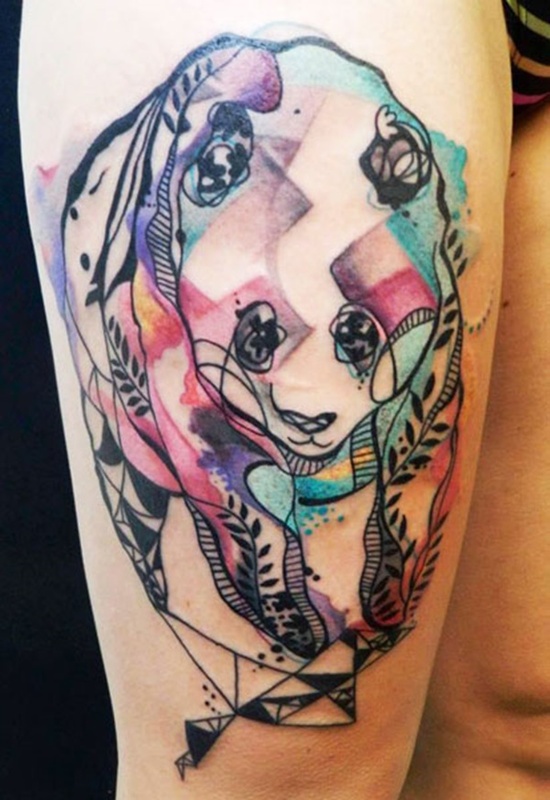 Swirled lines and patterns create the outline of a cartoon styled panda in this tattoo. Soft touches of color details the piece and creates complexity. 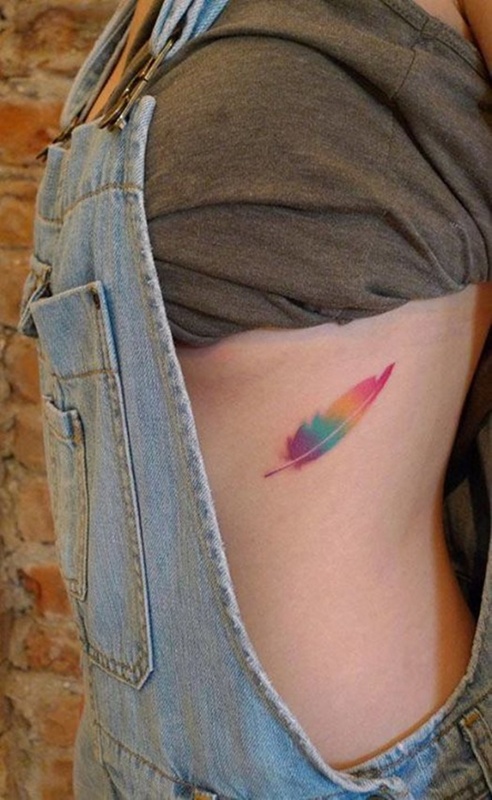 A feather is created using no outline and vibrant colors in this unique rib piece. 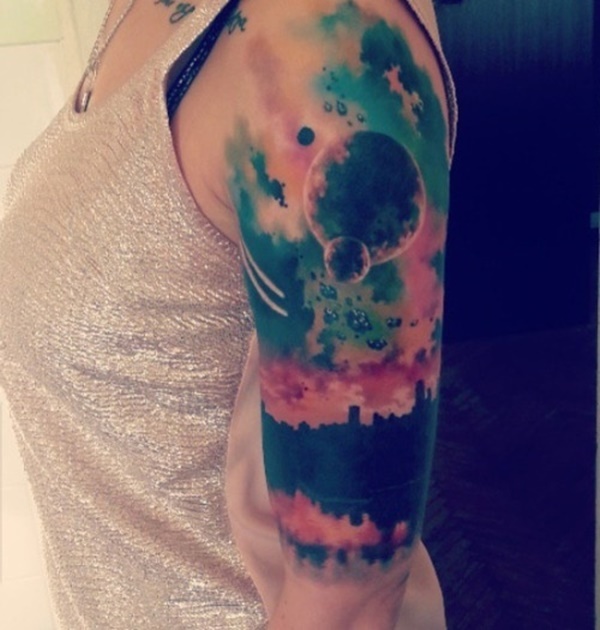 The silhouette of a cityscape is shown beneath a system of cosmic bodies in this phenomenal watercolor inspired piece. 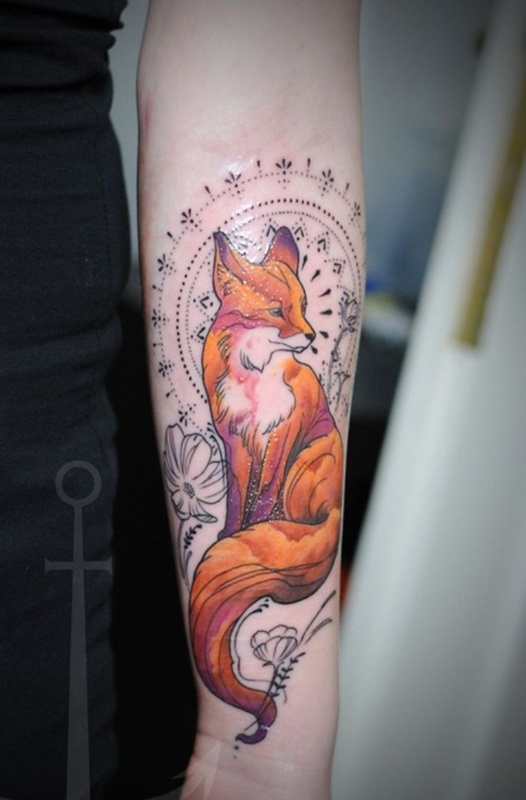 A realistically colored fox portrait is shown over a black mandala pattern in this beautiful tattoo. 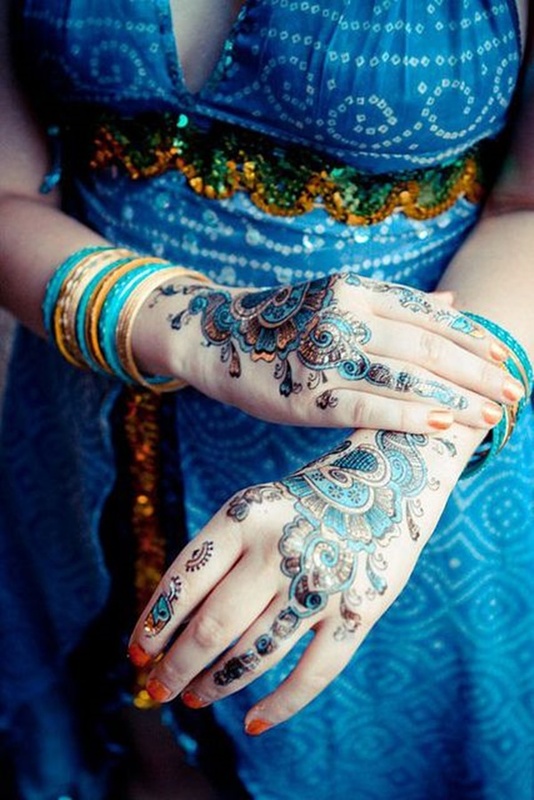 Ornate blue and gold mandala patterns adorn the wearer’s hands in this striking tattoo. 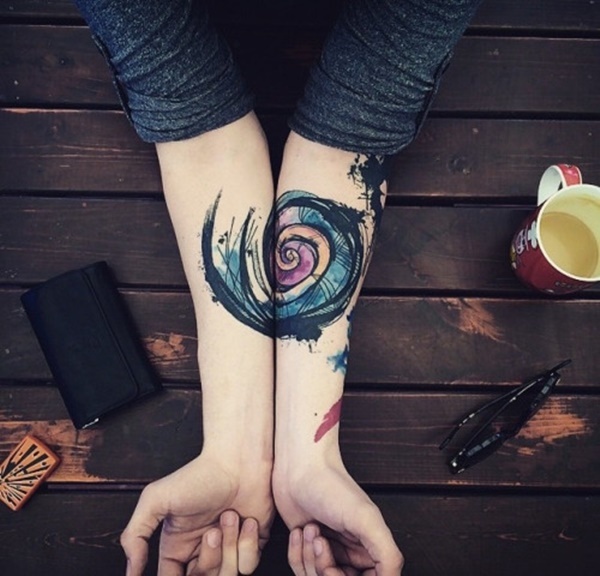 A swirl is created using black outlines and multiple colors in this swirl tattoo located on the wearer’s forearms. A rabbit is created using geometric shapes and colors including, green, blue, maroon, and purple. A cartoon style rendering of a bird is embellished with bright watercolors in this piece. 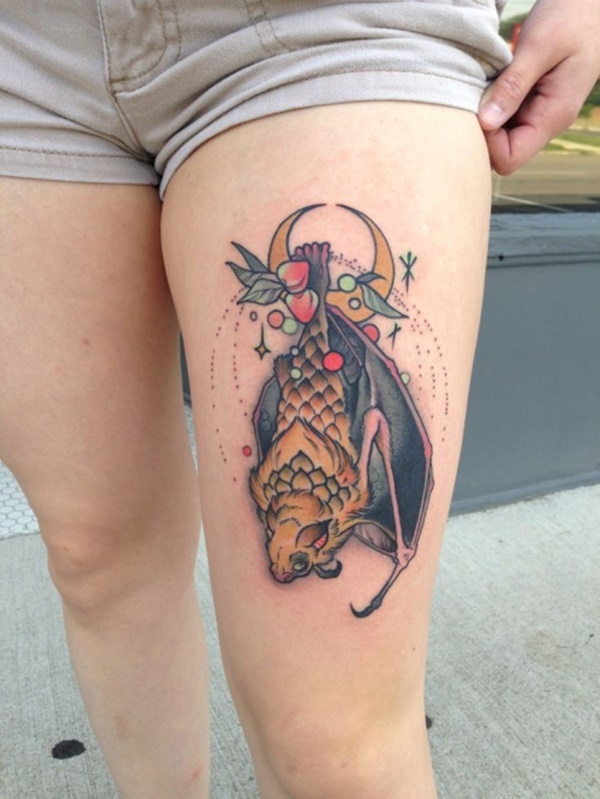 A stylized bat is shown hanging upside down in this thigh tattoo. Small berries and designs surround the bat and a small series of dots frames the piece. 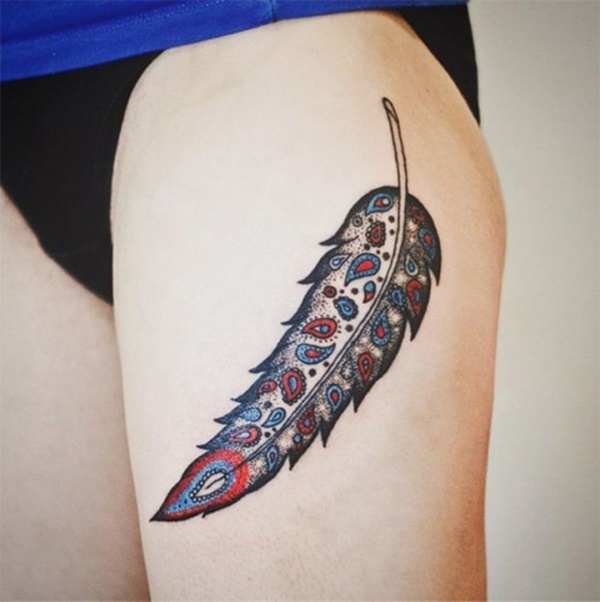 Blue and red paisley designs run the length of a black and gray feather in this thigh tattoo. 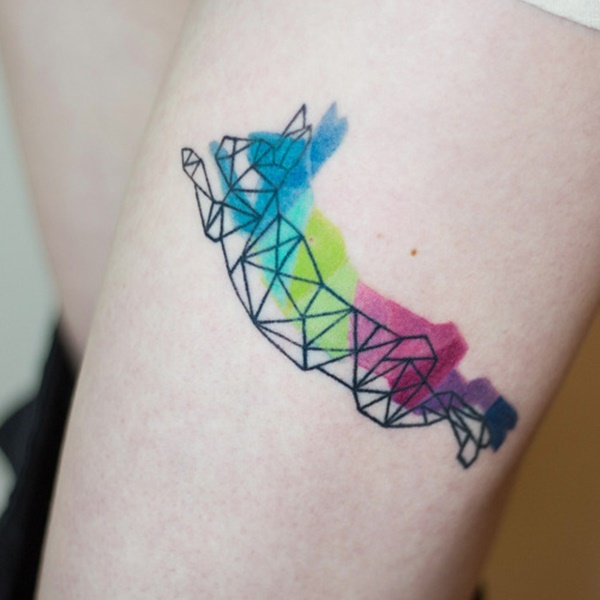 Similarly colored and shaped pieces adorn the wearer’s arm in this photo. An elephant is portrayed in black ink with red embellishments and jewels in this well-done piece. 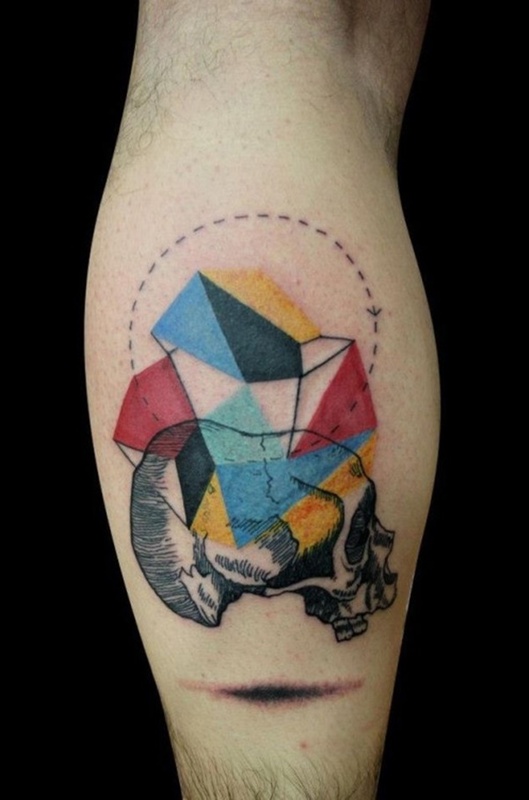 A dotted circle, colorful geometric shapes, and a skull missing the mandible comprise this odd tattoo. 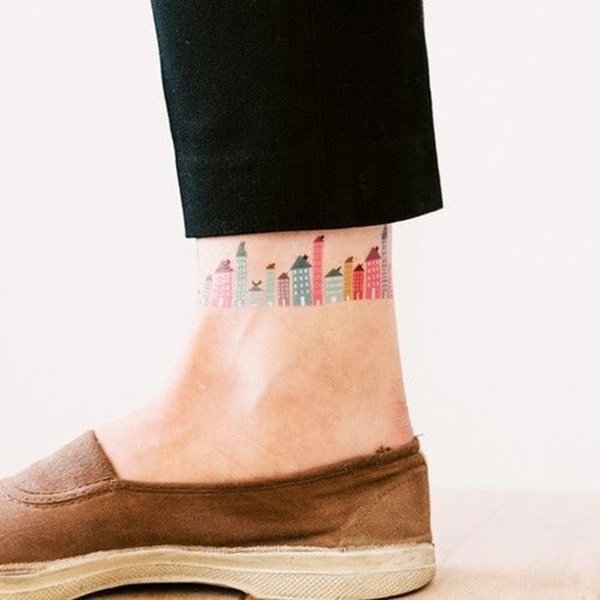 A series of simply drawn, colorful buildings create this ankle tattoo. 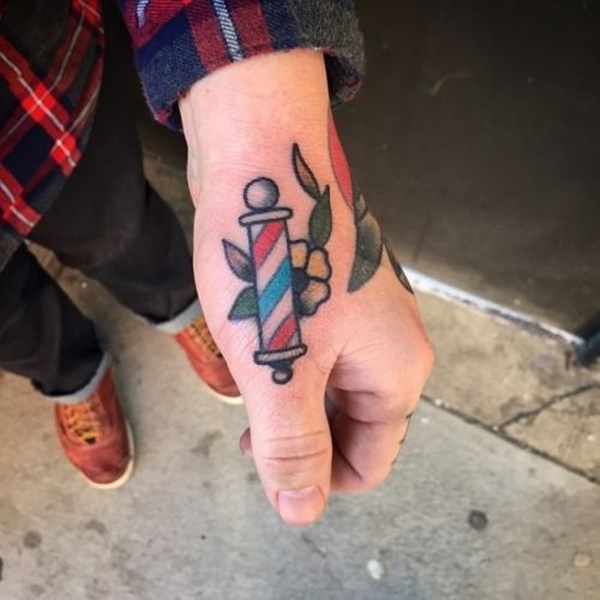 A barbers pole is accented with a yellow flower in this occupationally exclusive hand tattoo. 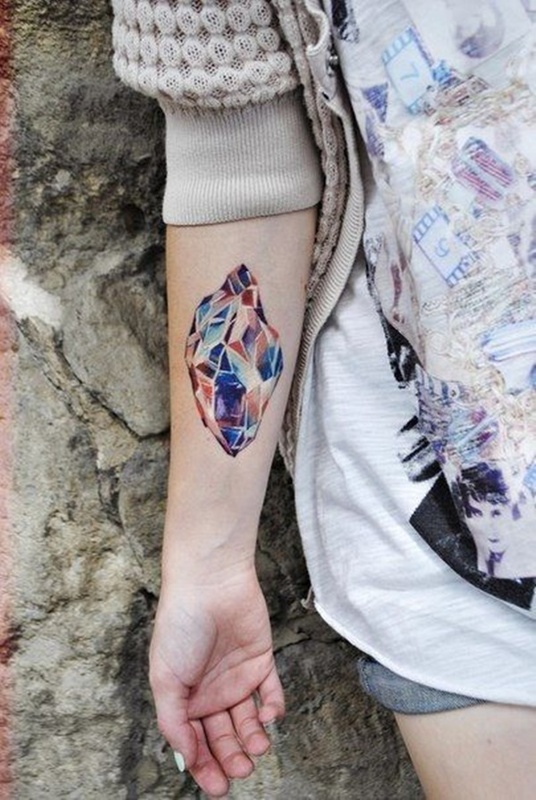 A multi-faceted gemstone is comprised using various colors in this unique forearm tattoo. 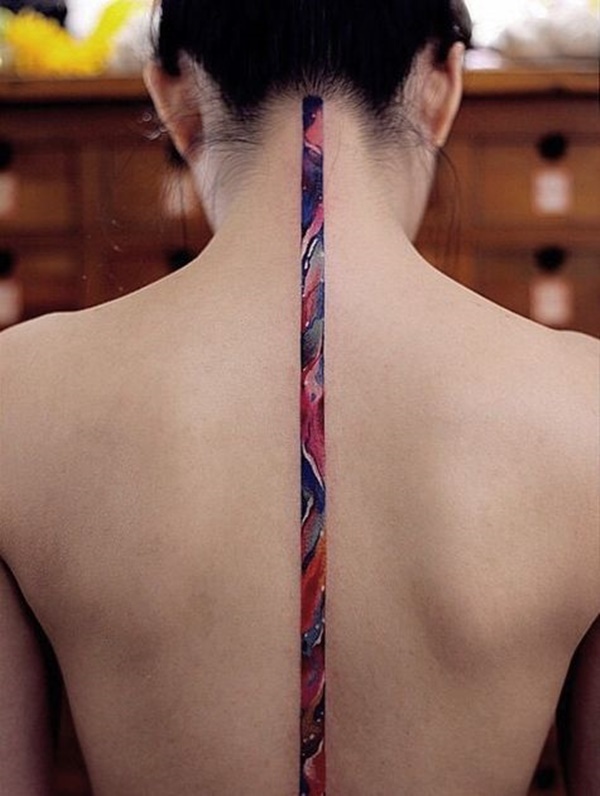 A multi-colored line runs the length of the wearer’s spine in this simple tattoo. 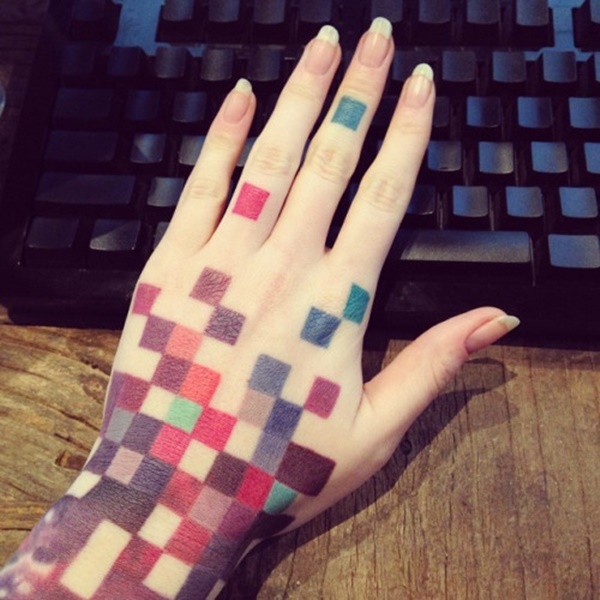 Blocks of various colors decorate the wearer’s hand in this straightforward tattoo. 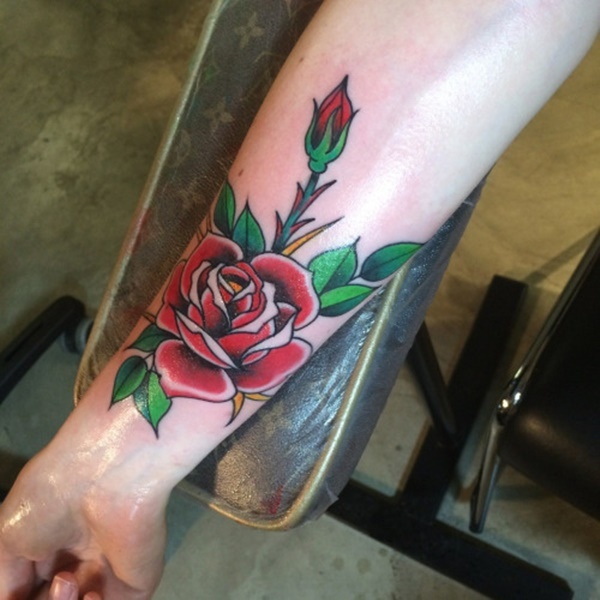 A bloomed rosebud overlaps a thorny stem leading to a rosebud that hasn’t bloomed in this forearm tattoo. 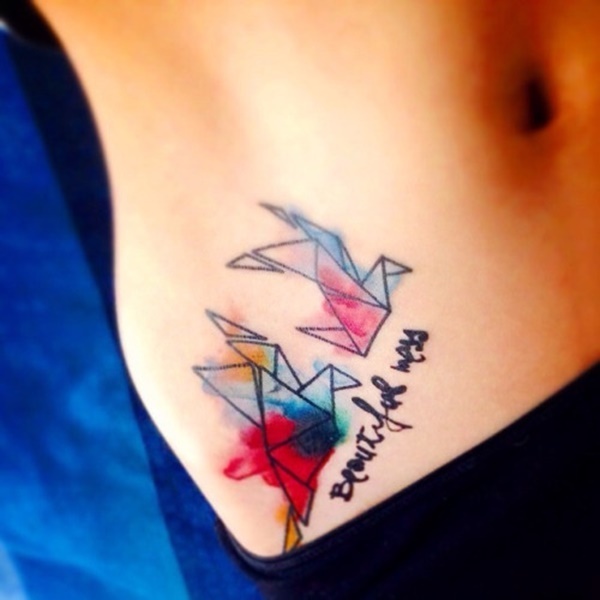 Two origami swans are colored using watercolor smudges in this cute tattoo. 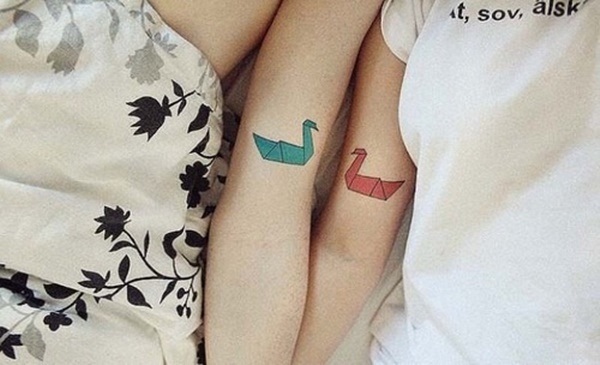 This pair of tattoos depicts a blue swan on one wearer’s bicep and a red swan on the other wearer’s bicep. 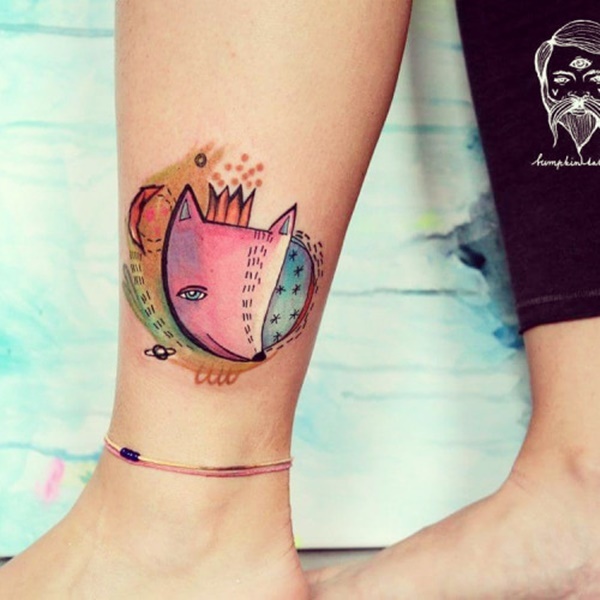 A pink cartoon fox is shown with a small crown on its head and is overlapping a colorful background embellished with patterns and planets in this ankle piece.